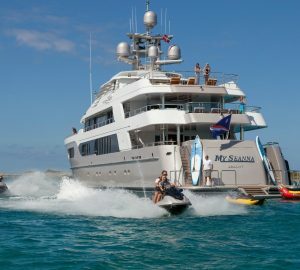 Motor Yacht MY SEANNA (ex NEWVIDA) was built in 2001 by Delta Marine and first refitted in 2009. 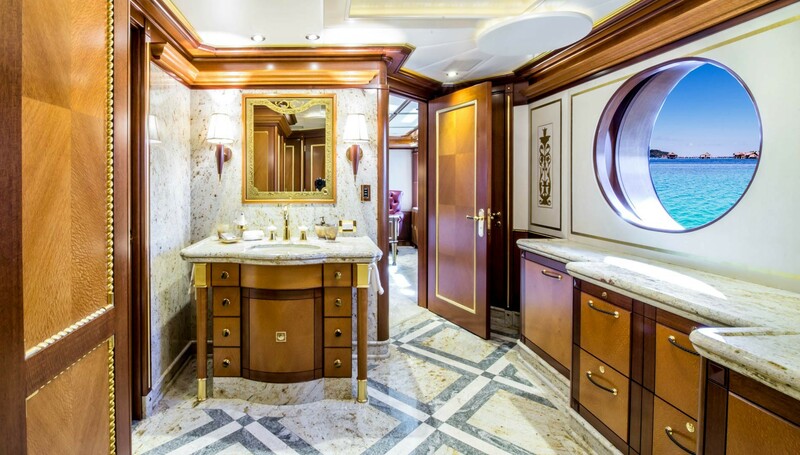 In 2013/14 she underwent a significant interior and exterior re-build by Rybovich Shipyard. 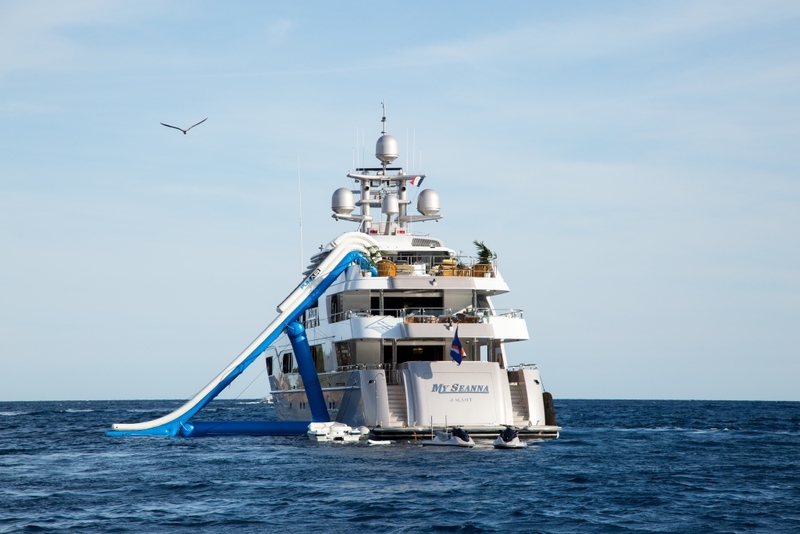 The yacht has been extended from 48,77m (160’) to 56,40m (185ft) in length; extending the hull and the decks, creating a swim platform and beach club. 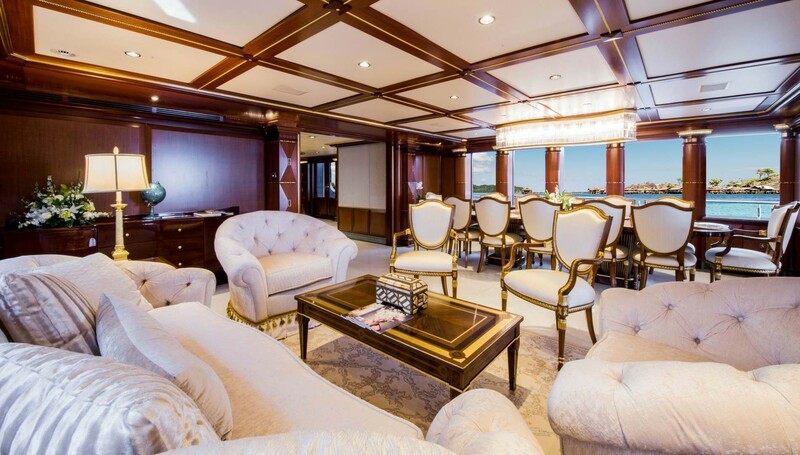 The main salon located on bridge deck boasts a 61" flat screen TV and a generous lounge area plus cushioned window seating and a Gran Tour player piano. 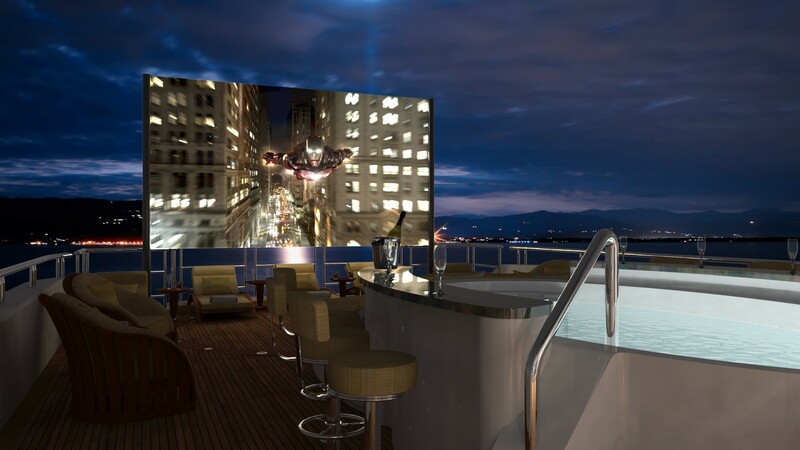 The decorative window panels offer the option of a complete blackout for cinema viewing. 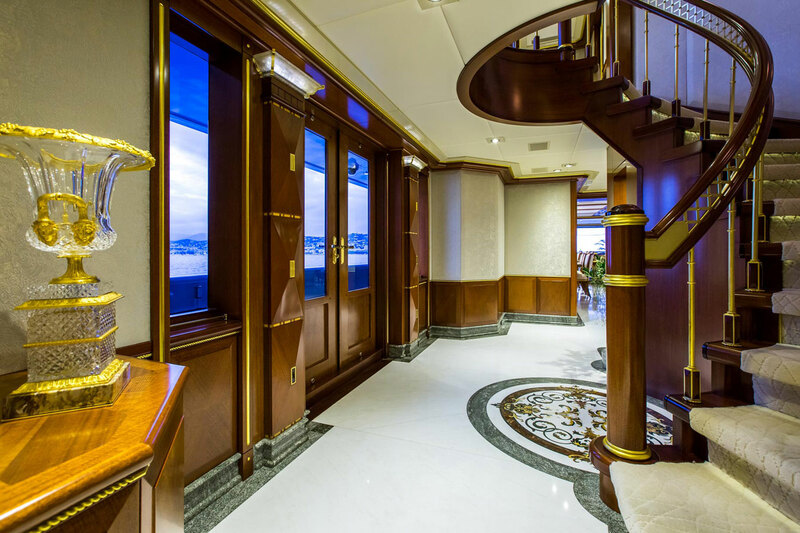 From the main salon, there is access to the aft and the upper deck. 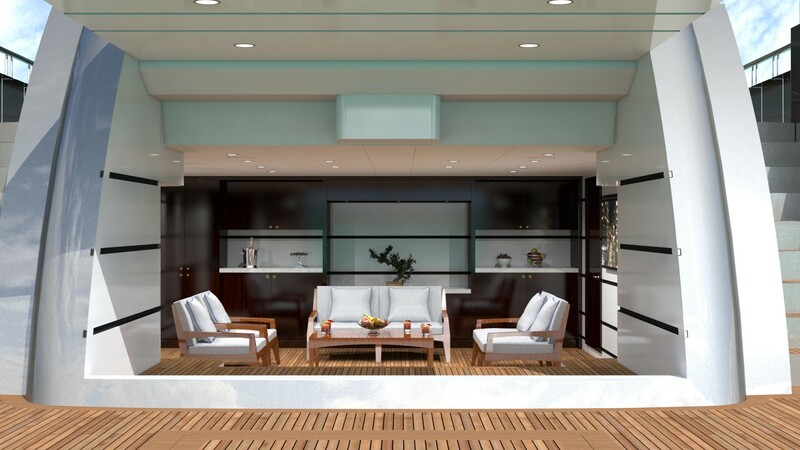 There is also a day head forward of the main salon. 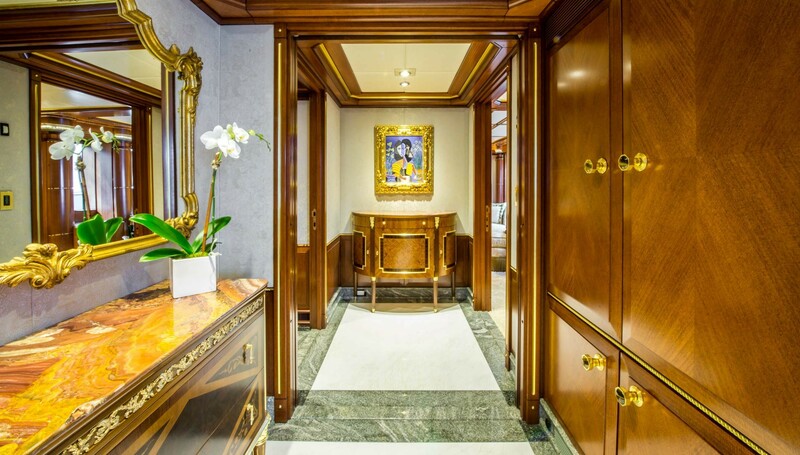 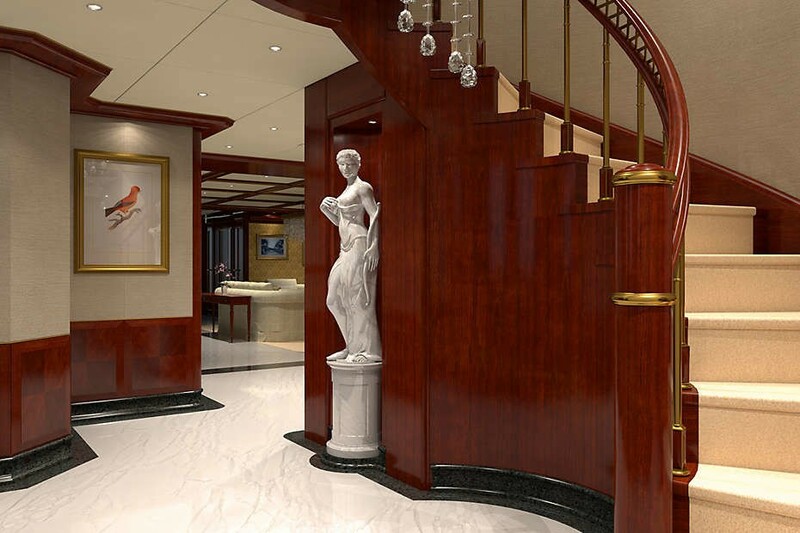 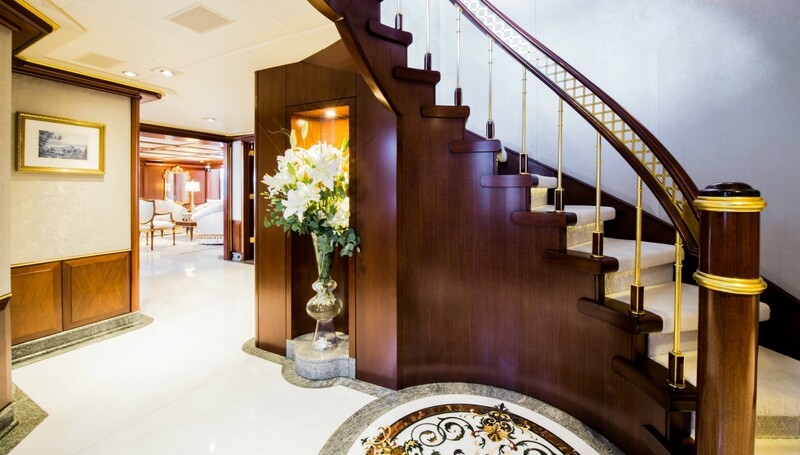 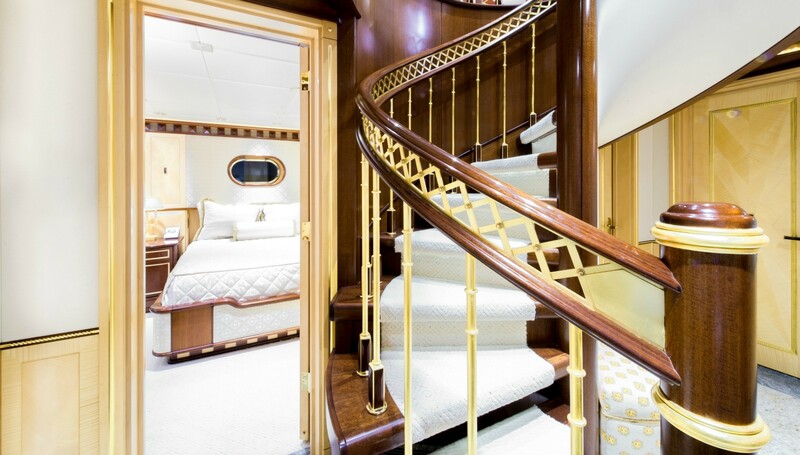 As you enter the yacht from the Aft Deck, you are greeted by a magnificent staircase which begins down below in the guest accommodation and spirals all the up to the Main Salon. 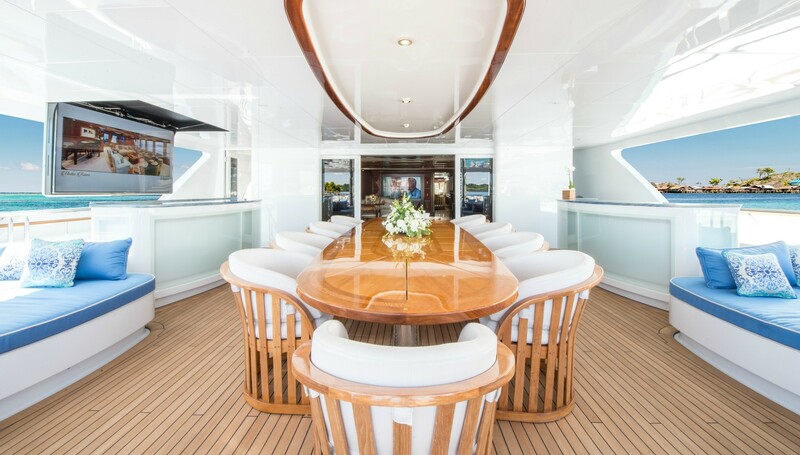 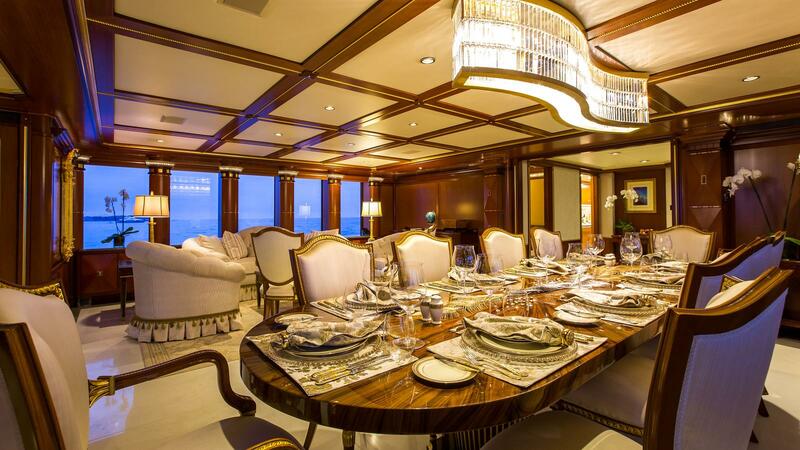 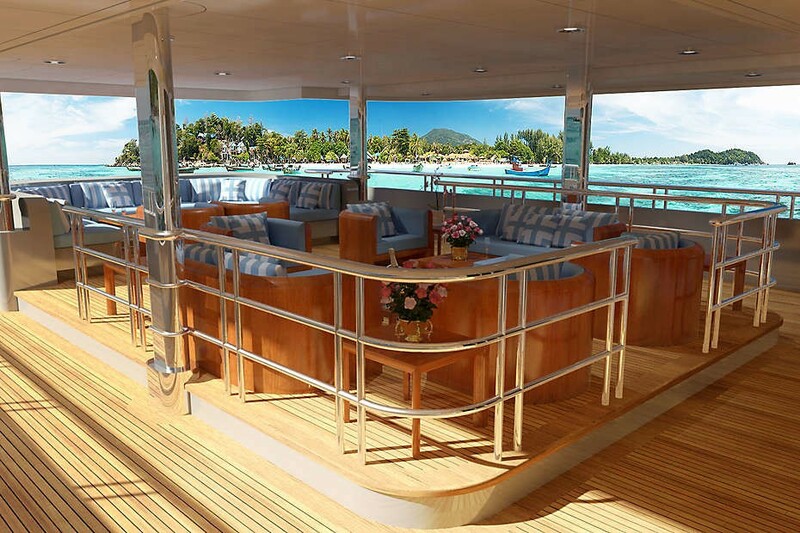 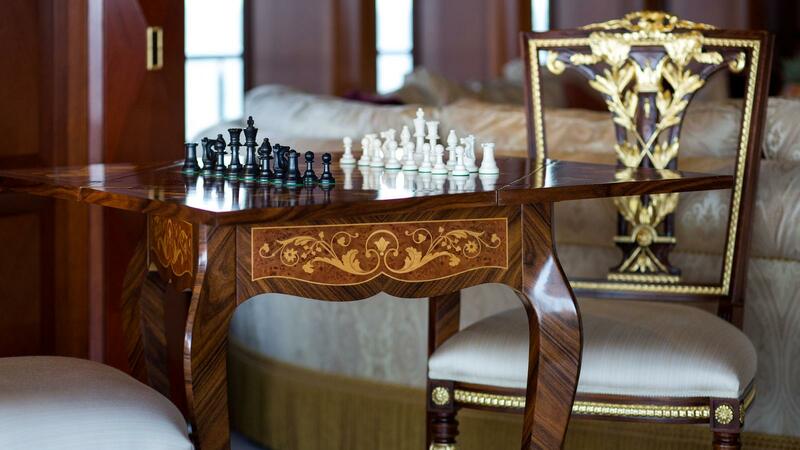 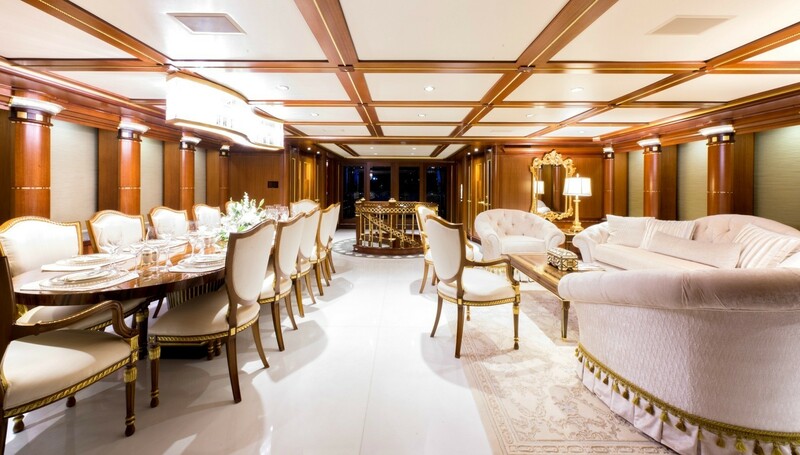 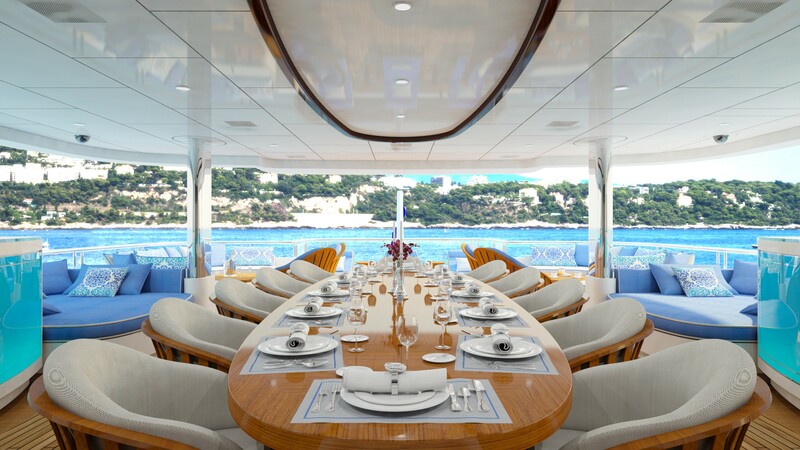 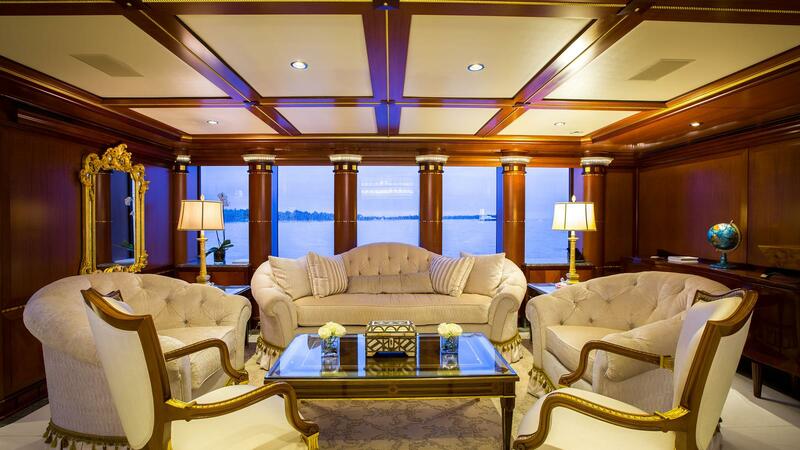 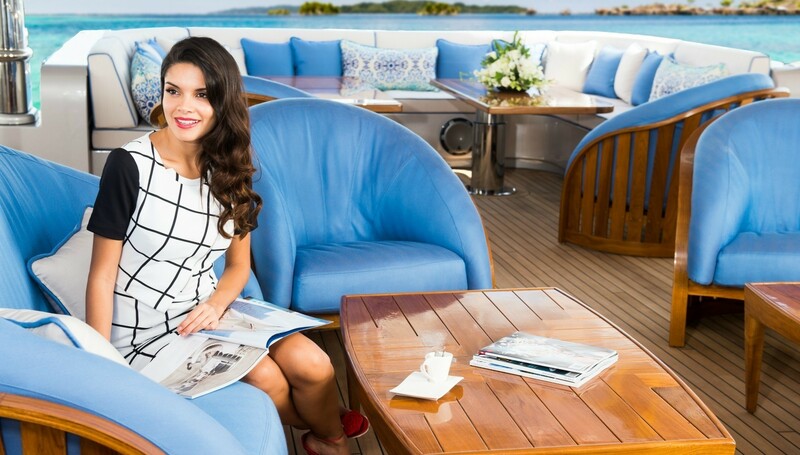 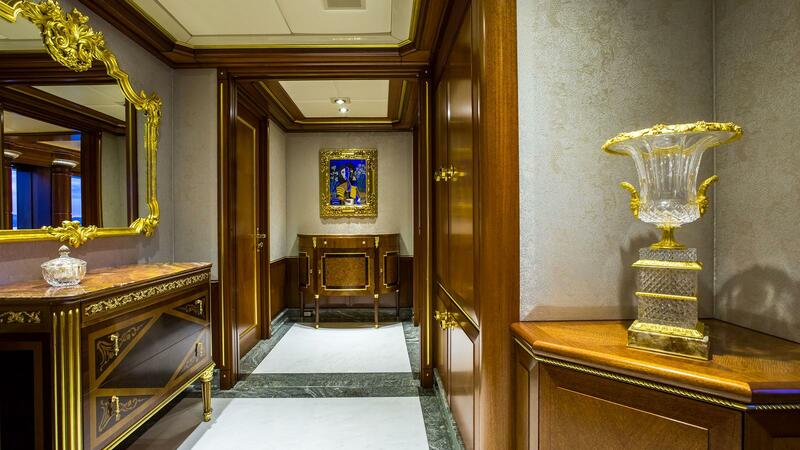 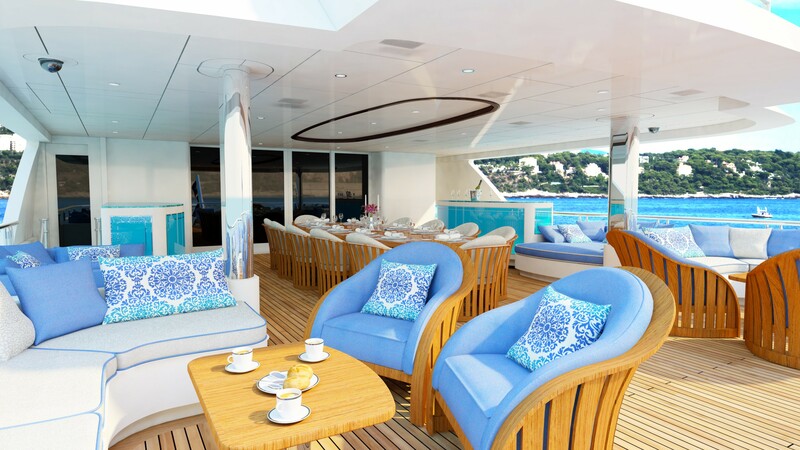 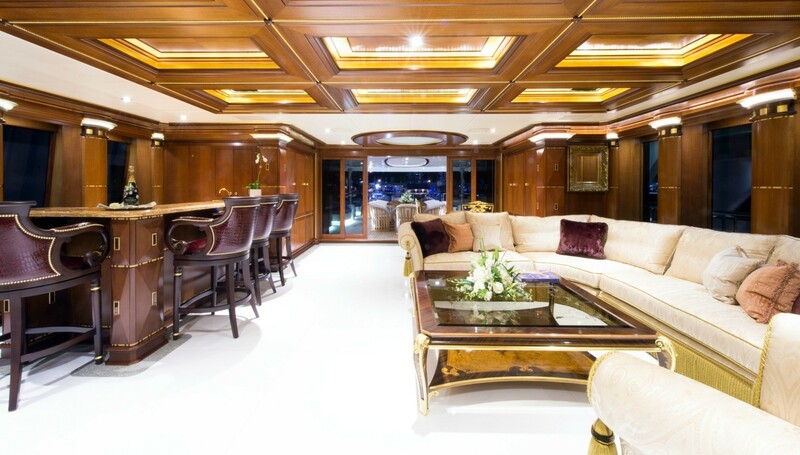 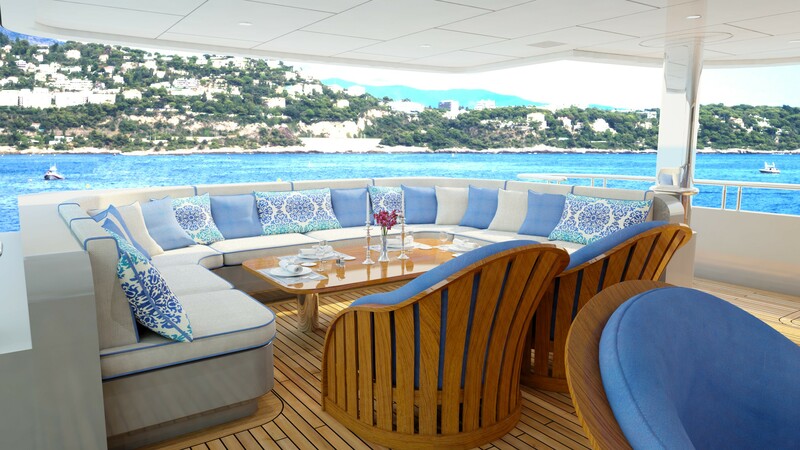 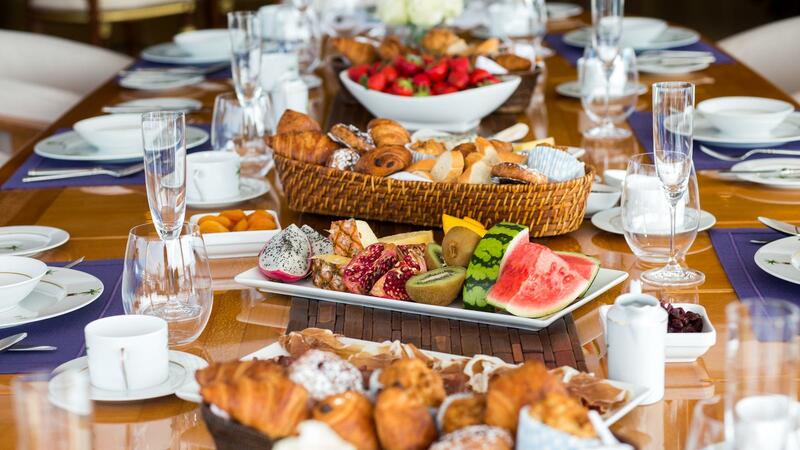 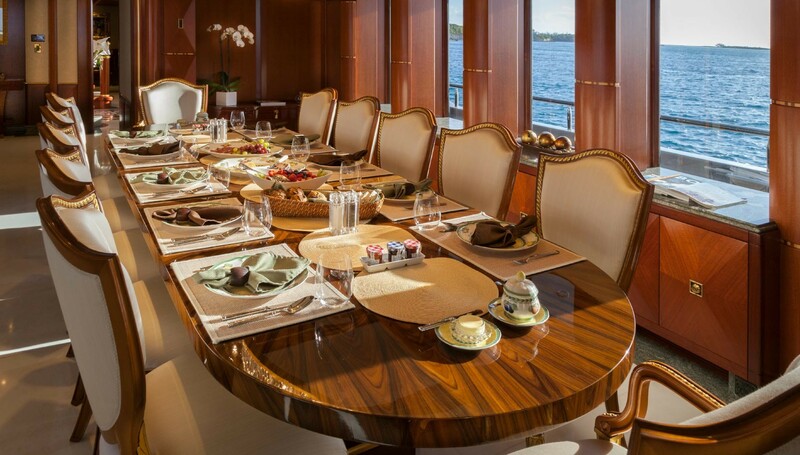 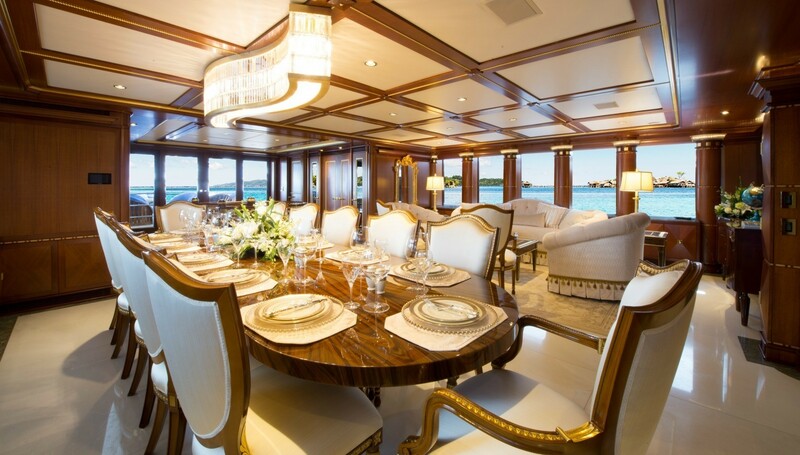 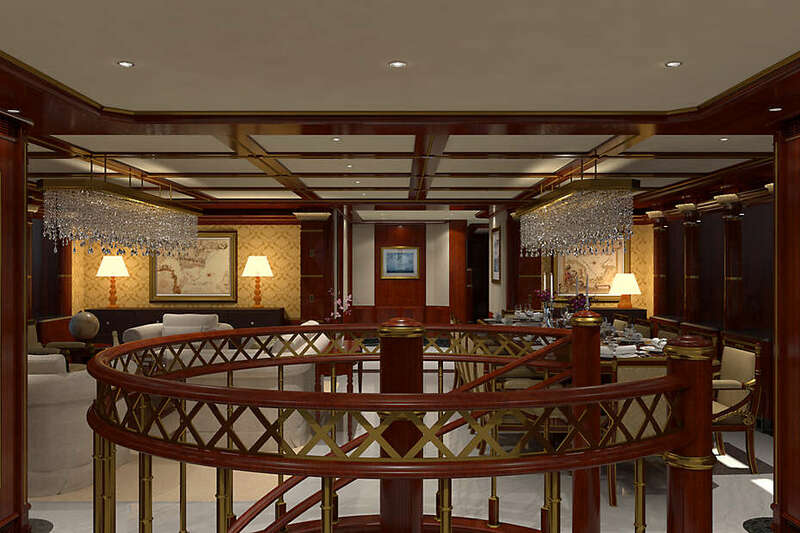 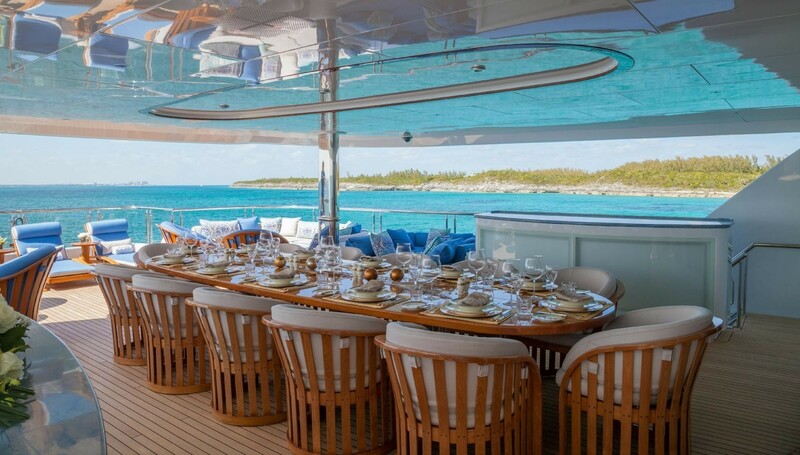 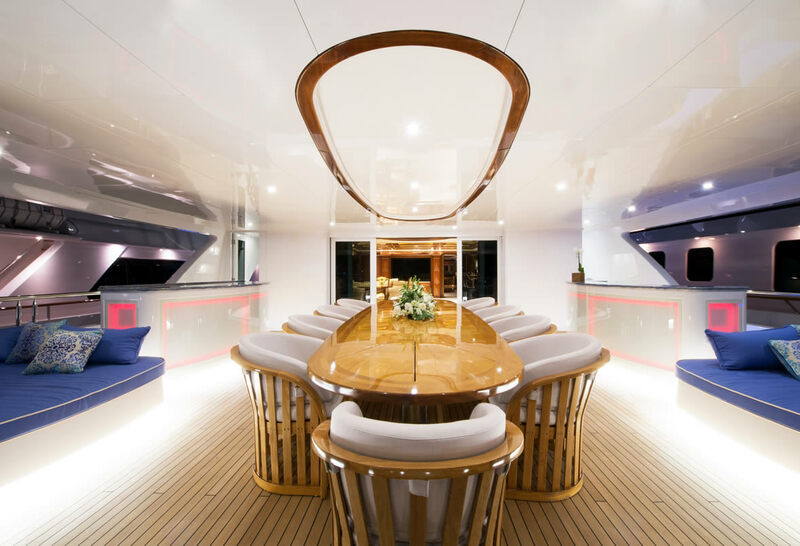 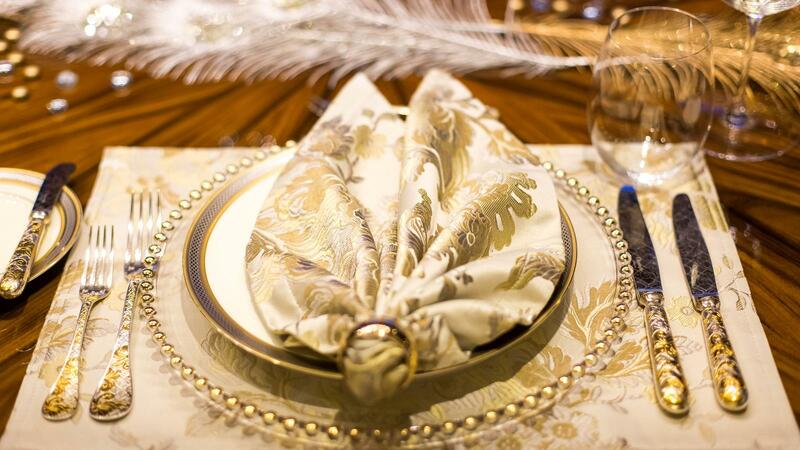 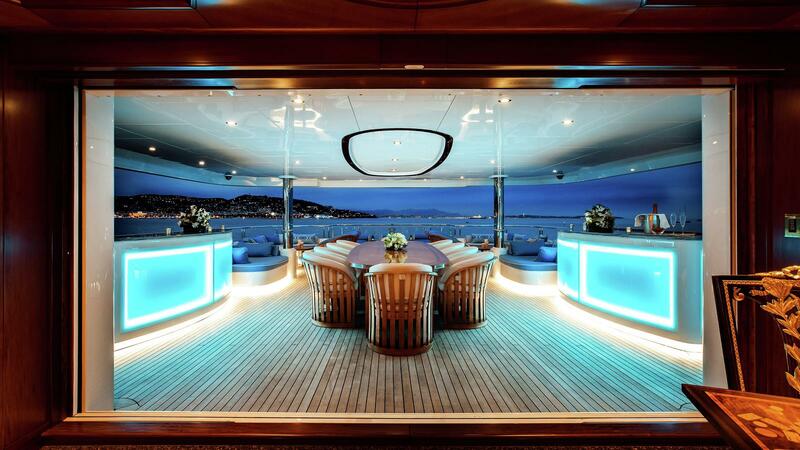 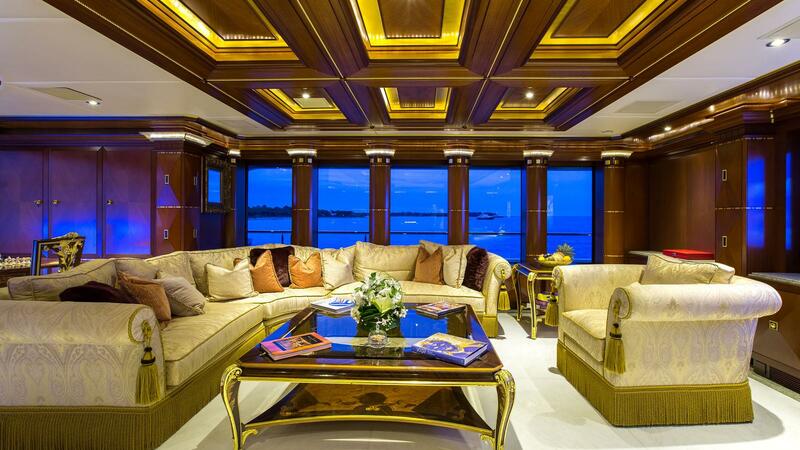 The dining area is located on the main deck and can seat 12-14 guests on her custom Versace dining chairs. 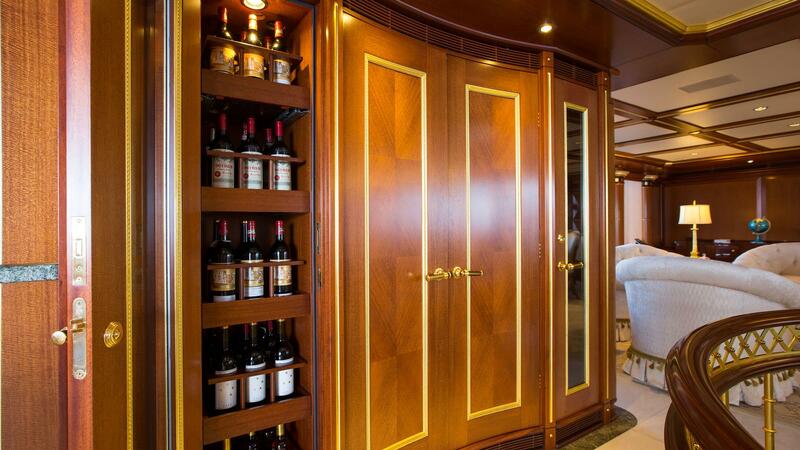 There is a large service pantry aft as well as a Wine Cellar and two day-heads. 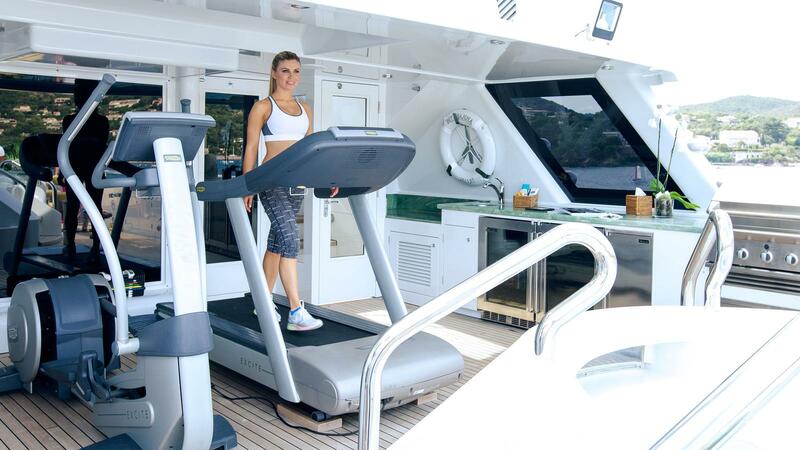 The gym features a treadmill, free-weights and dumbbells along with a 26" flat screen TV. 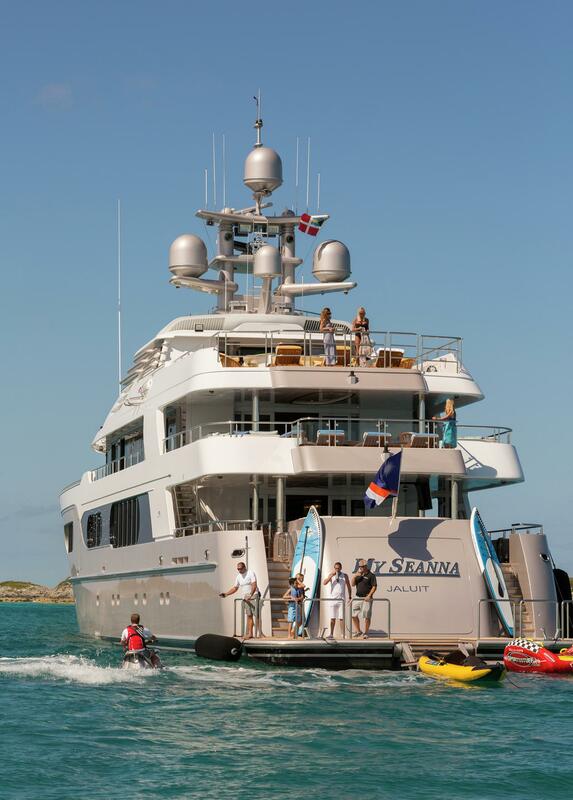 MY SEANNA has equally impressive exterior spaces. 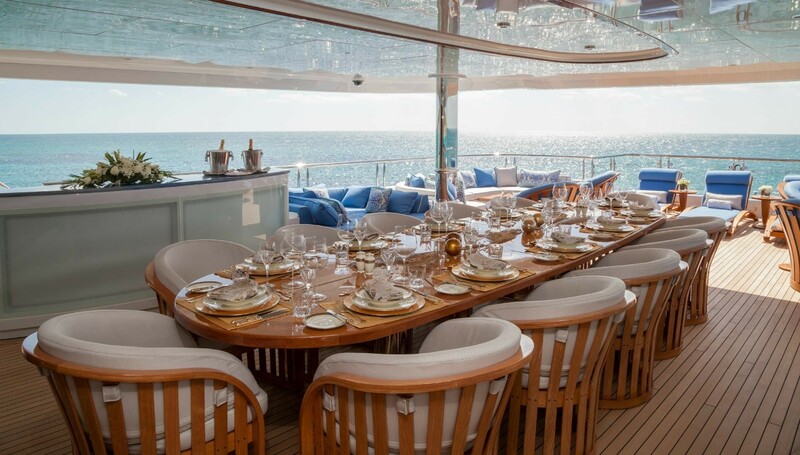 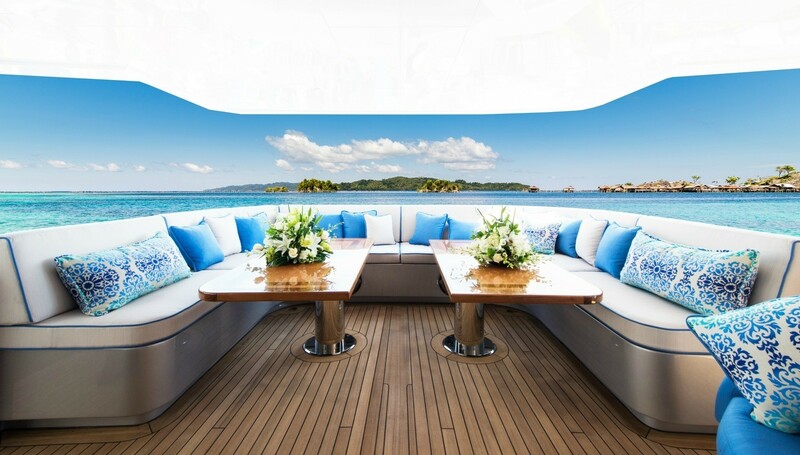 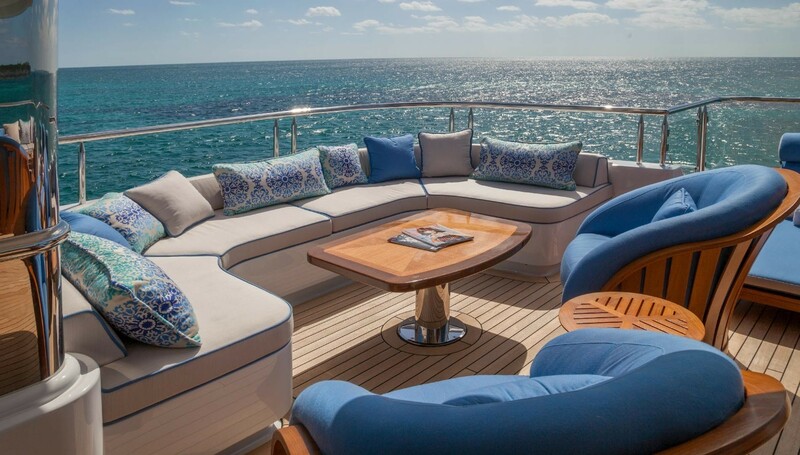 Her aft deck offers alfresco dining for 12 guests and a service area forward on the starboard side. 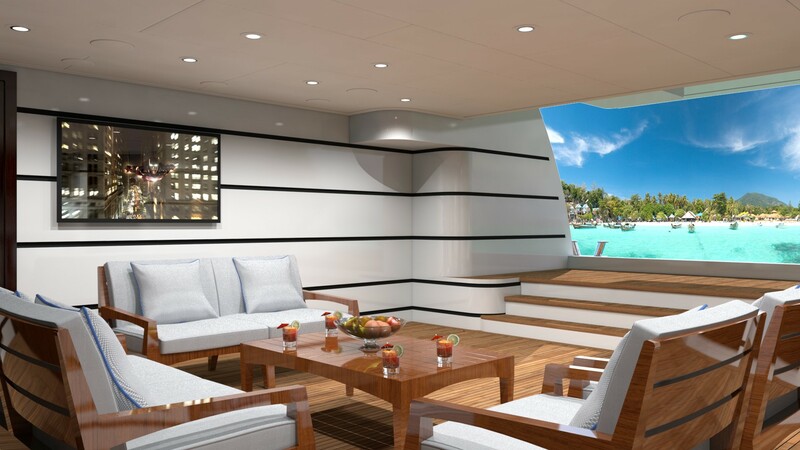 The aft deck also boasts a 42" Flat screen TV and music on demand. The upper aft deck on the bridge deck, which is aft of the main salon has additional seating for 10-12 and also has a 42" flat screen. 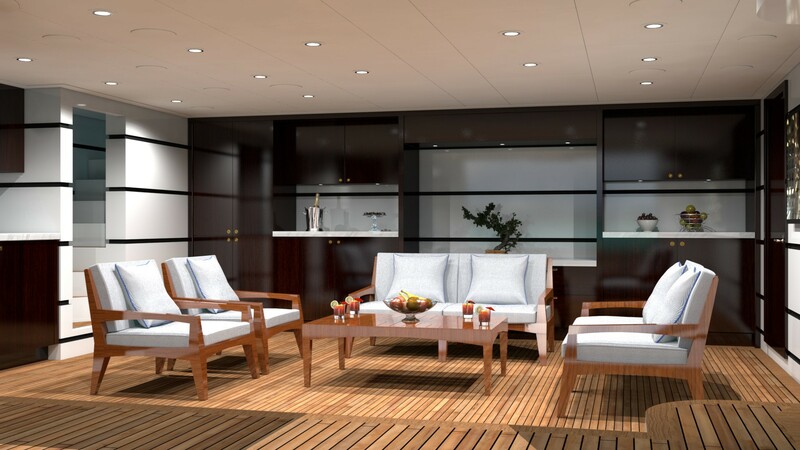 This area can convert to disco-tech with special lighting, a dance floor and stereo system available. 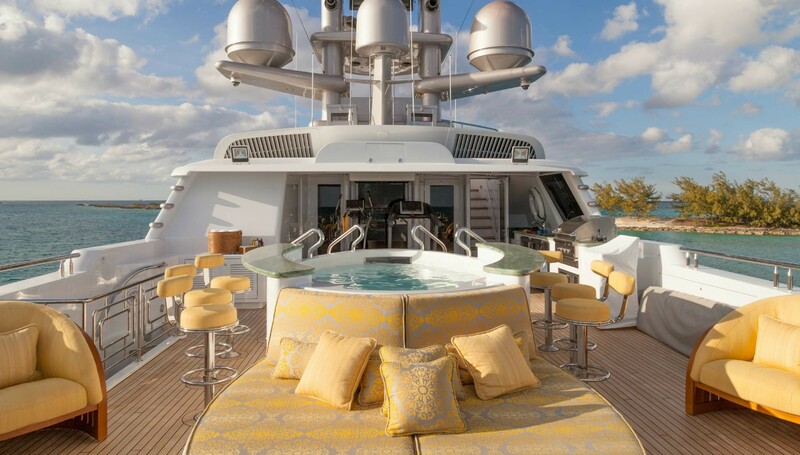 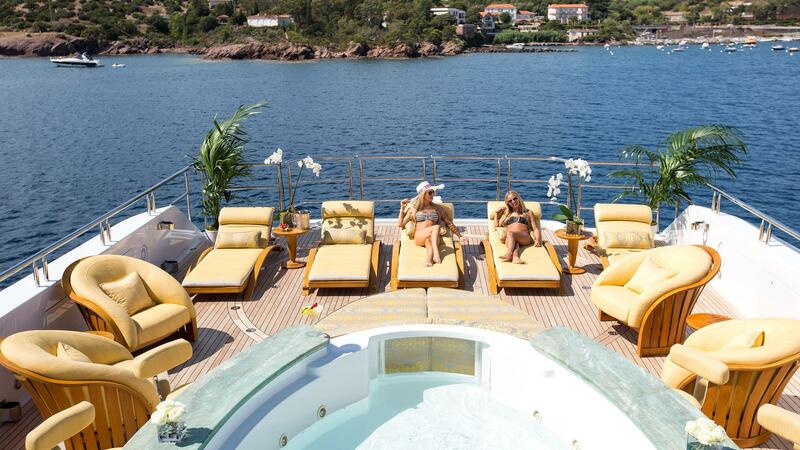 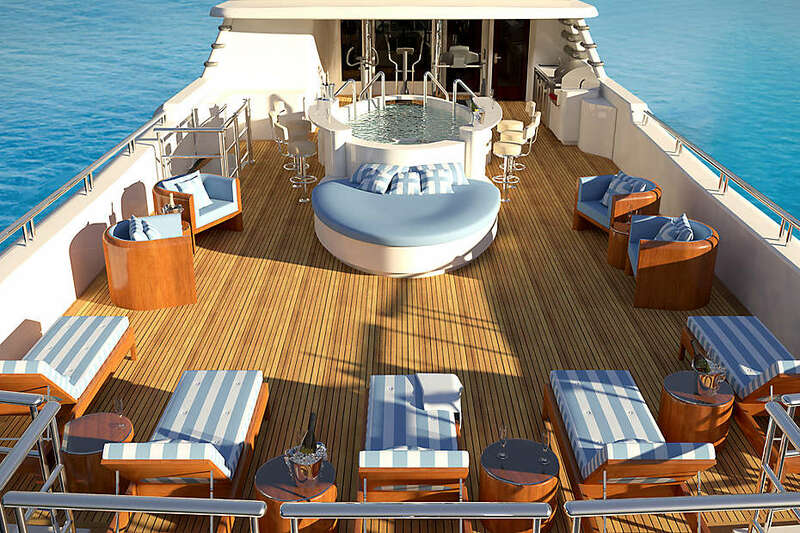 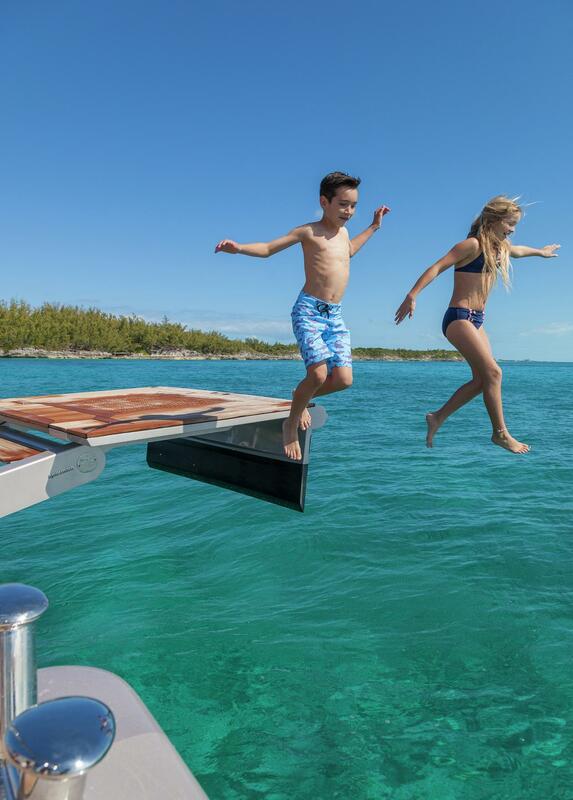 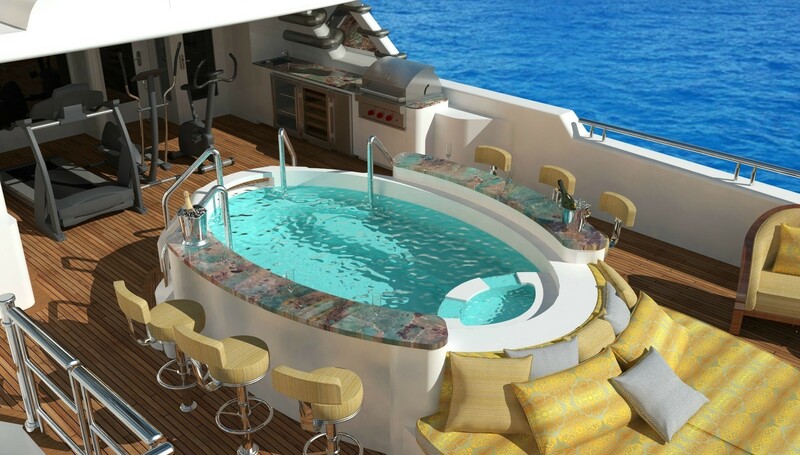 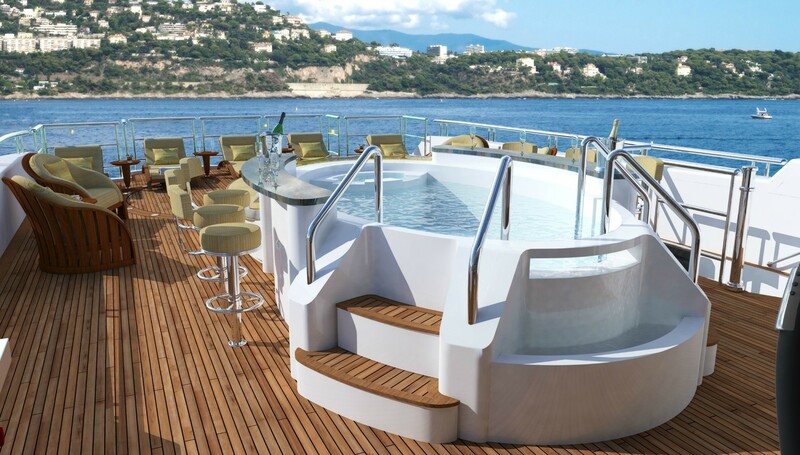 The yachts sundeck features a Spa Pool and more Alfresco Dining. 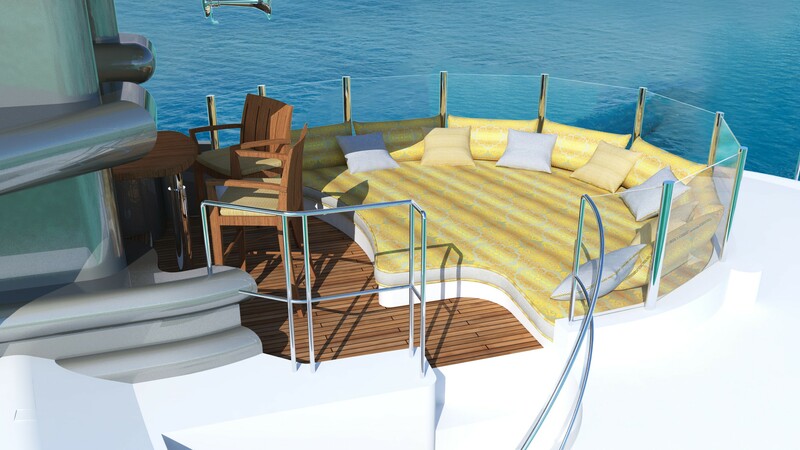 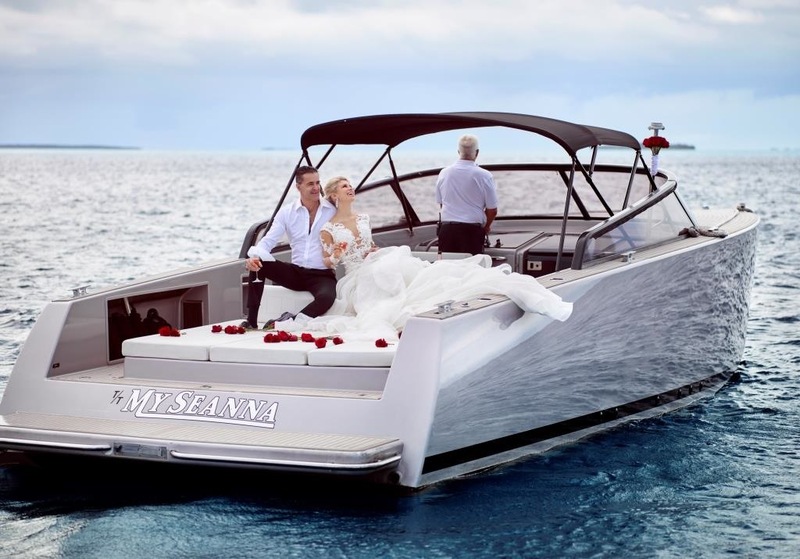 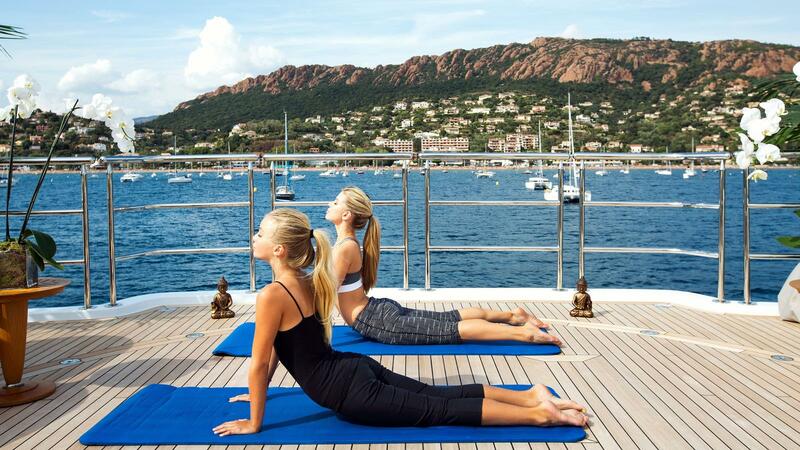 The sundeck also has a 42" flat screen, five chaise lounges and a convenient Day head. 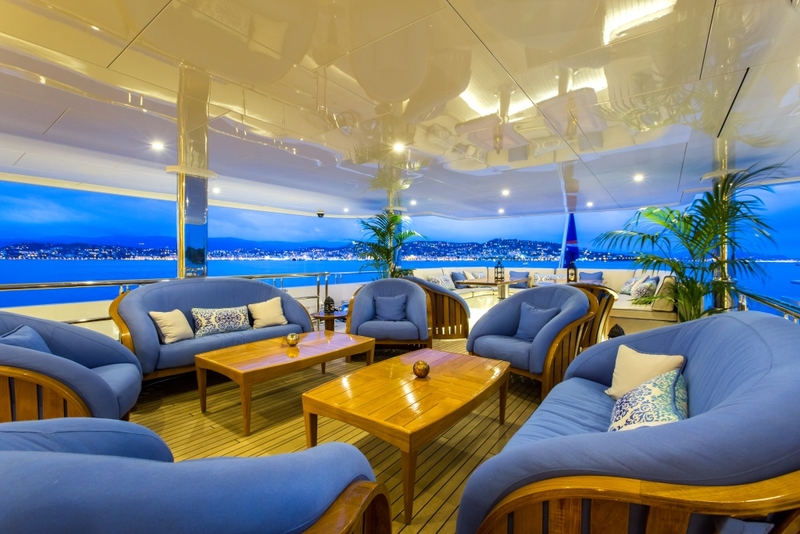 The Crow’s nest is a small covered seating area with spectacular panoramic views high above the water. 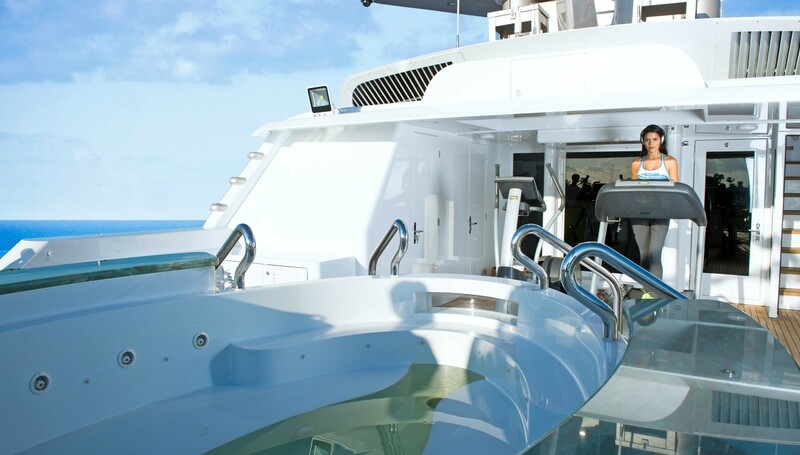 This can be used as an alternate Bridge for Captain. 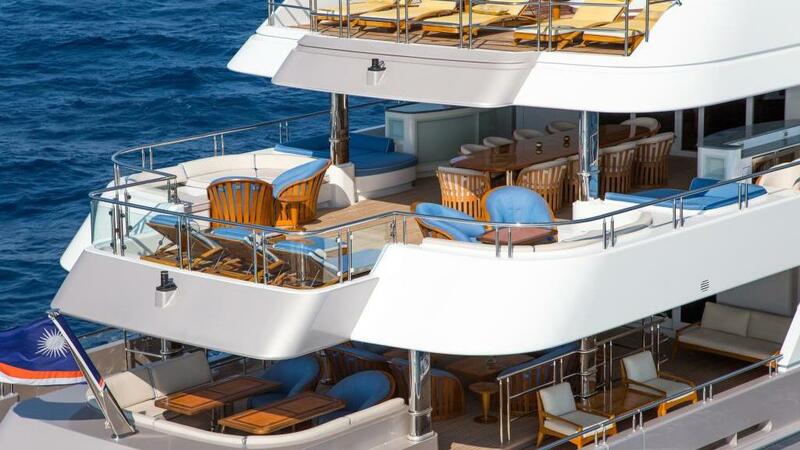 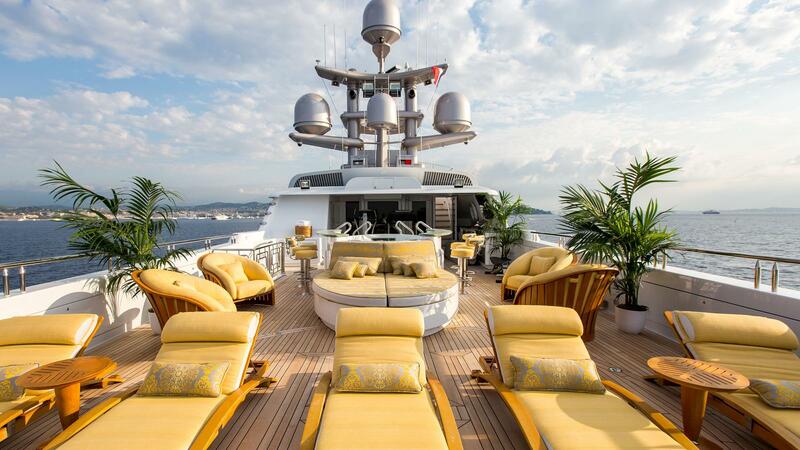 There is an additional sunning area forward on the main deck with six chaise lounges. 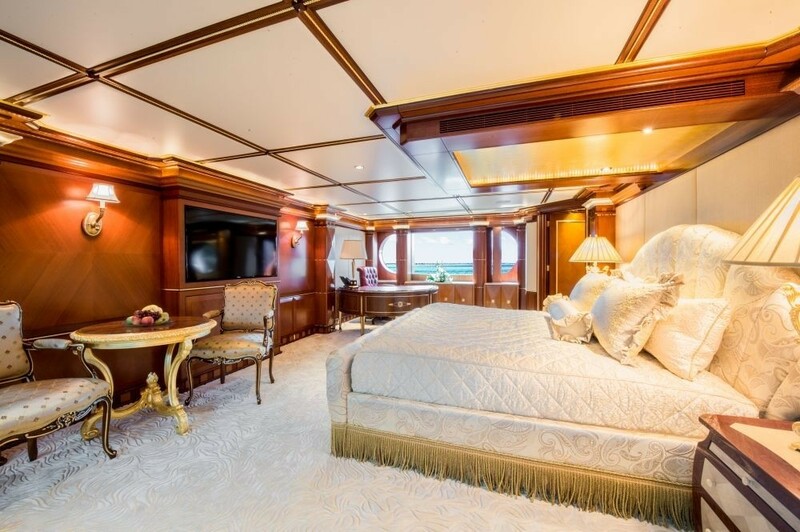 Accommodation is offered for up to 12 guests in six lavish staterooms including a main deck owner's suite and a VIP cabin located on the bridge deck which offers a commanding 360-degree ocean view. 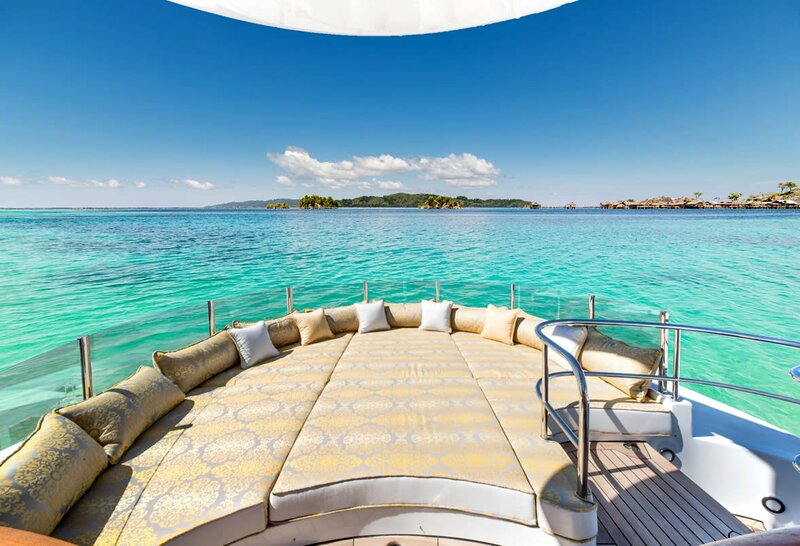 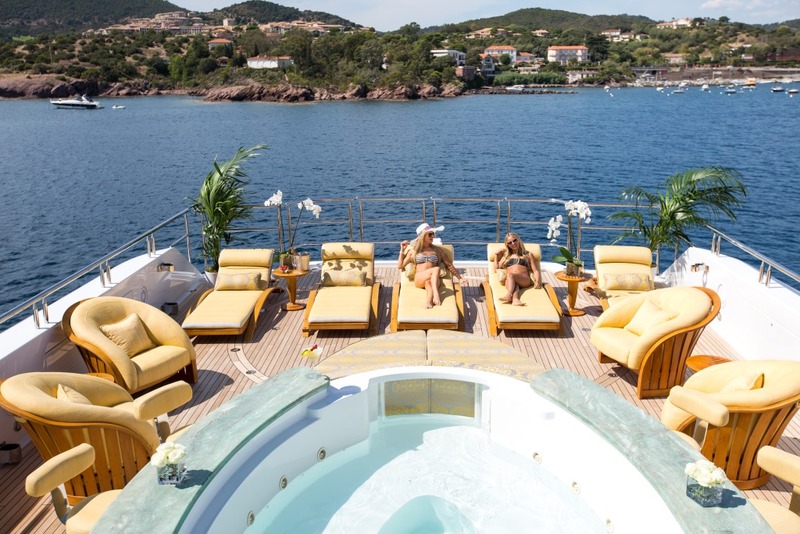 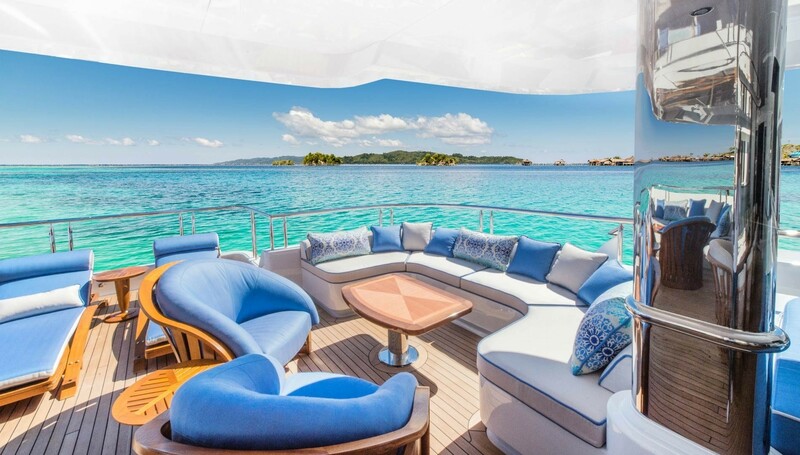 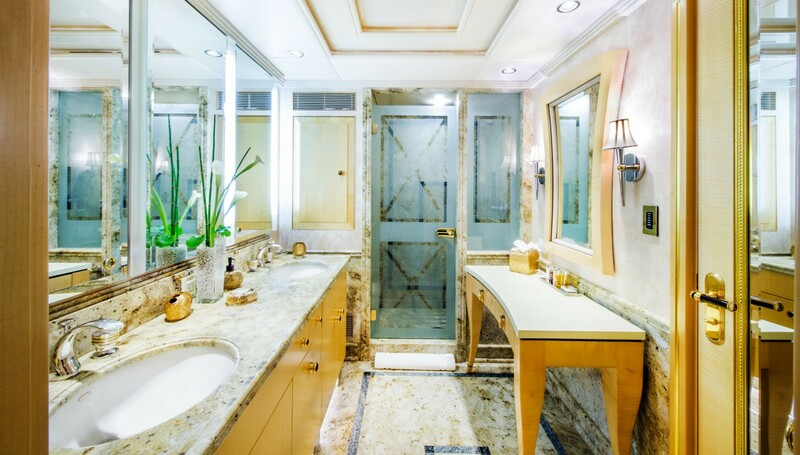 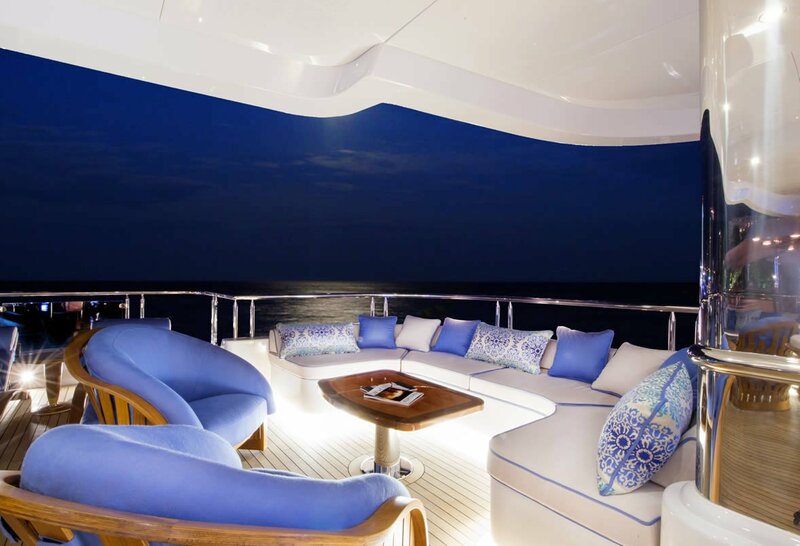 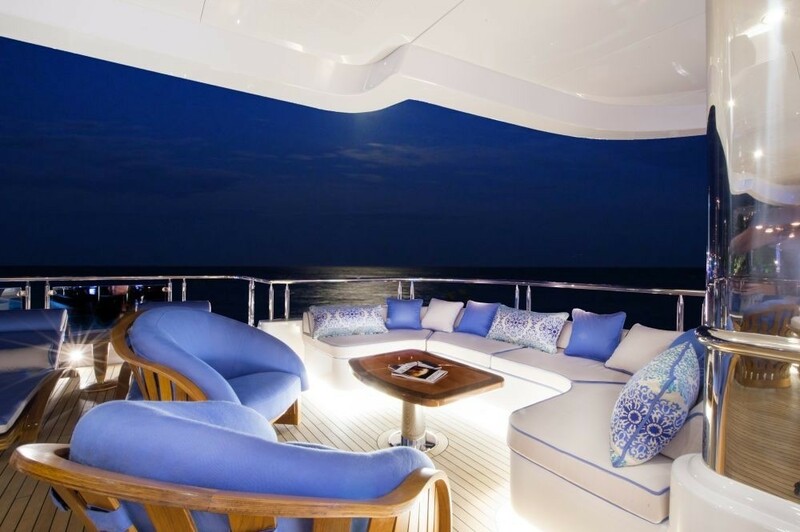 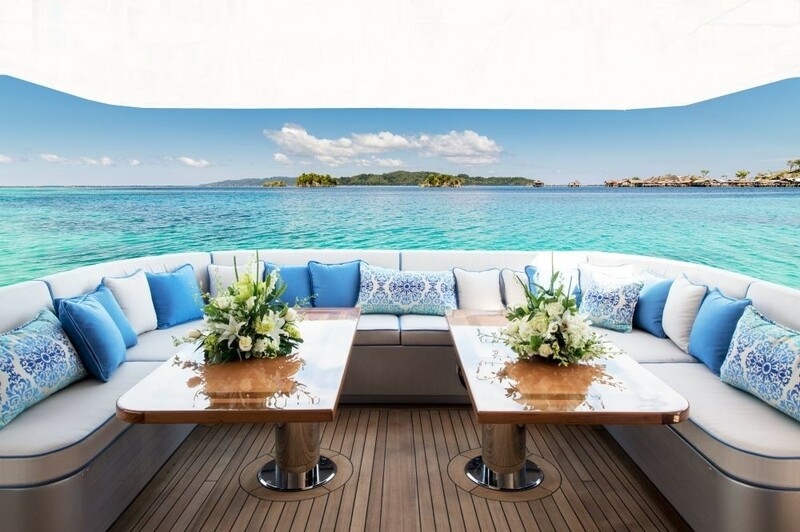 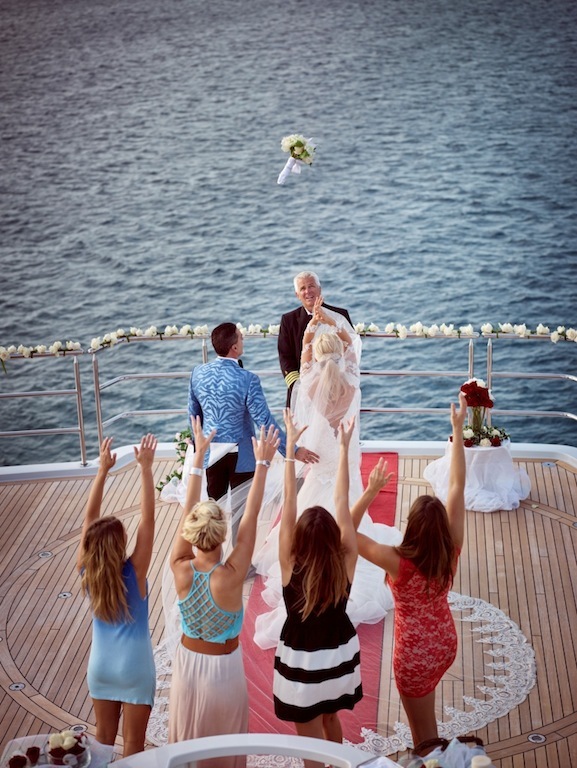 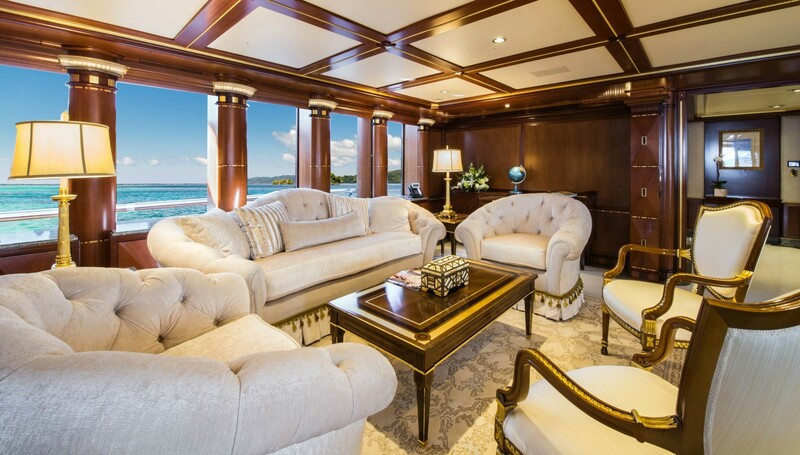 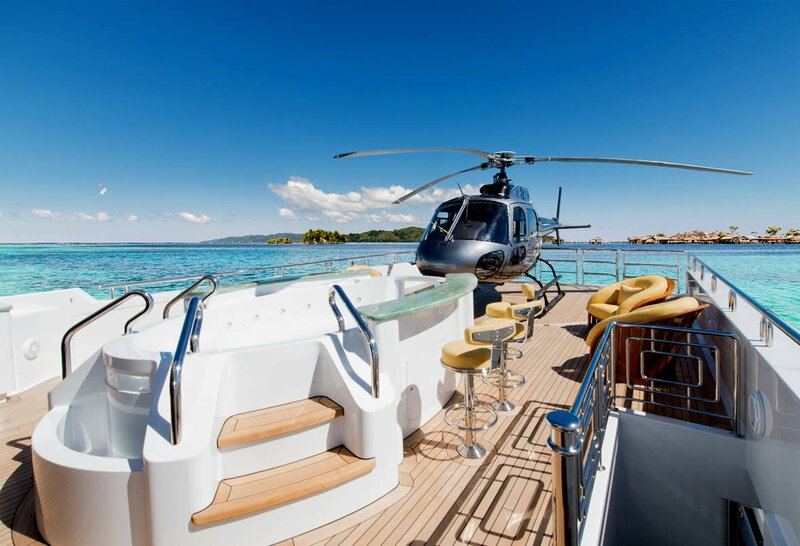 This beautiful yacht has opulent and sophisticated interior and features a multitude of outdoor and indoor entertainment and relaxation areas, where her charter guests will be able to relax and entertain in style. 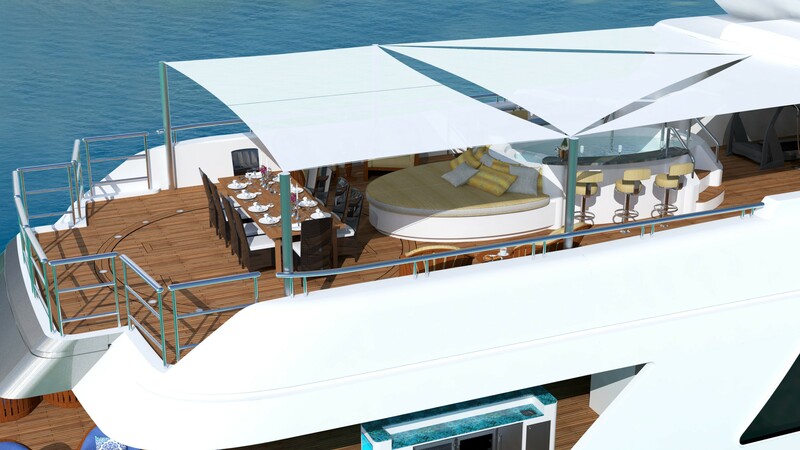 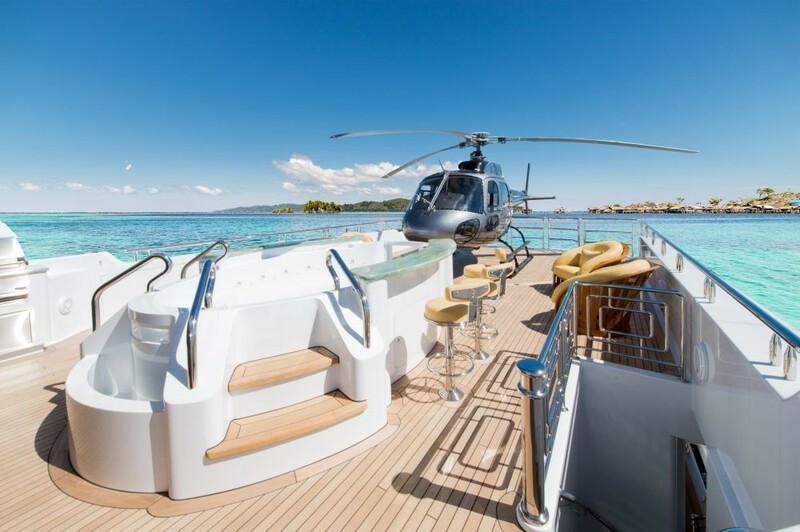 The new Beach Club and Ocean Deck are particularly impressive, creating a closer-to-the-sea cruising experience. 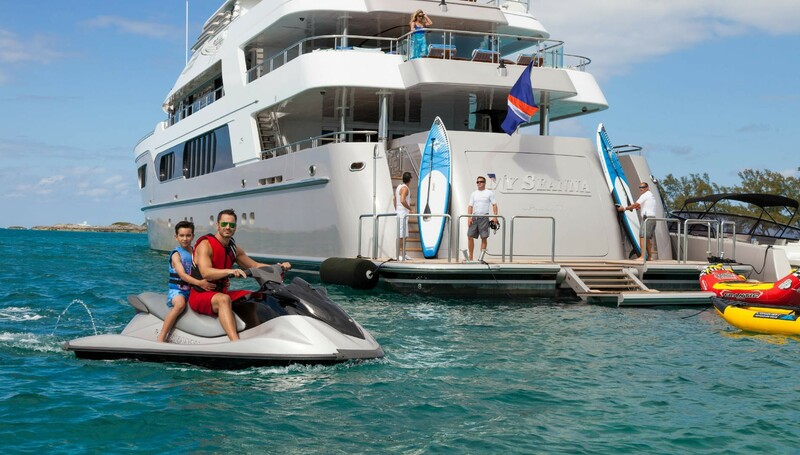 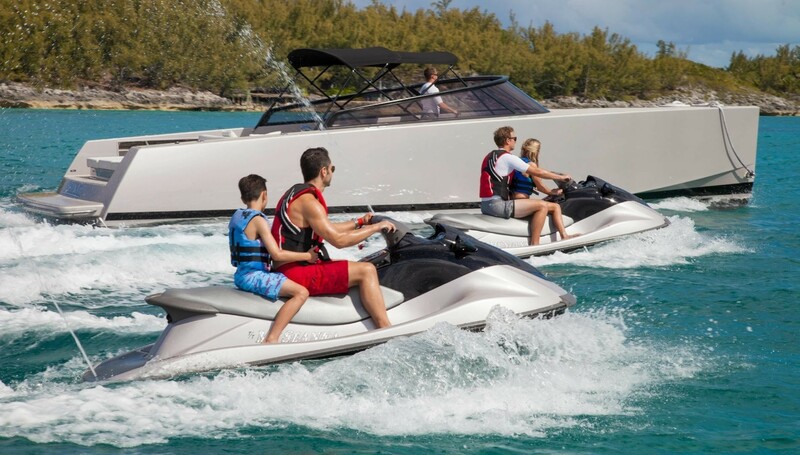 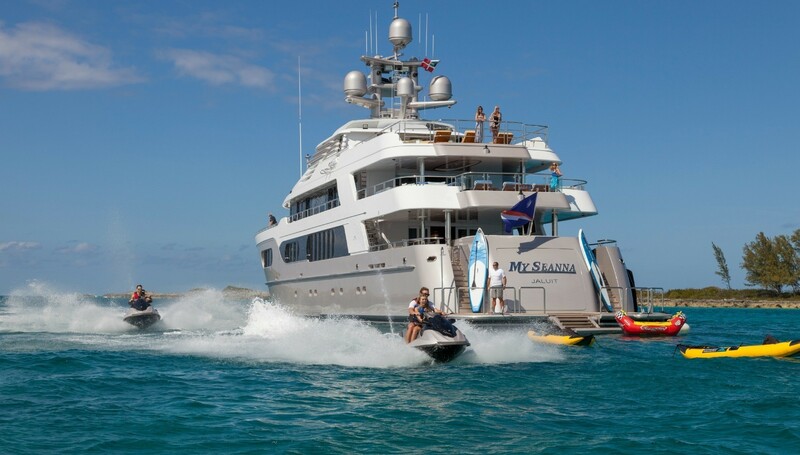 The variety of water toys offered on board is vast and includes the 12.2m Van Dutch towed tender, 5.2m Nautica rib tender, two wave-runners, two inflatable kayaks, waterskis, two wake-boards and tows, stand-up paddle board, snorkeling gear, to mention but a few. 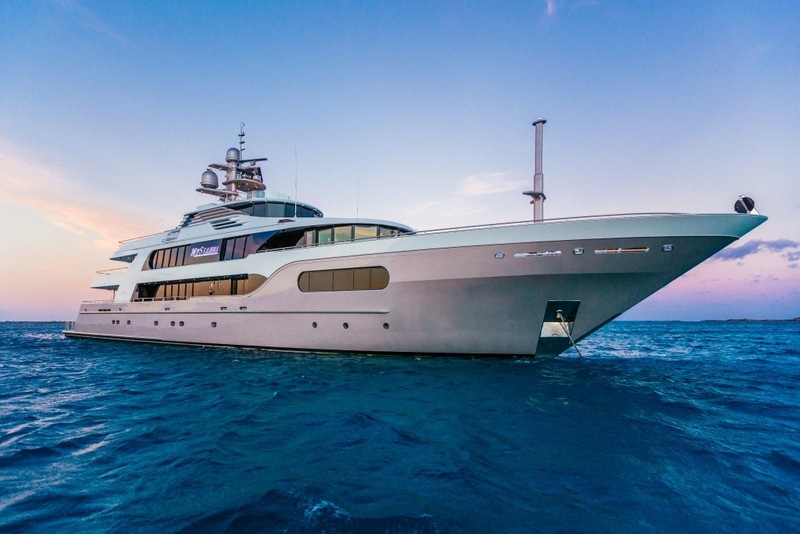 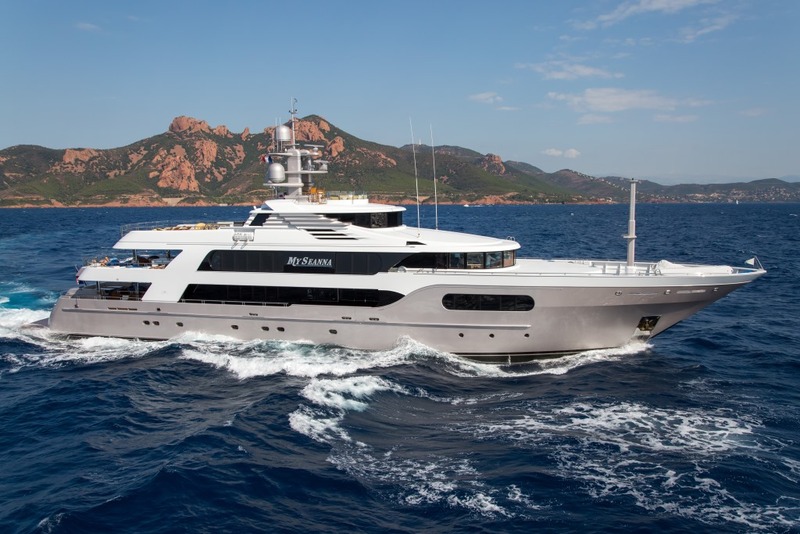 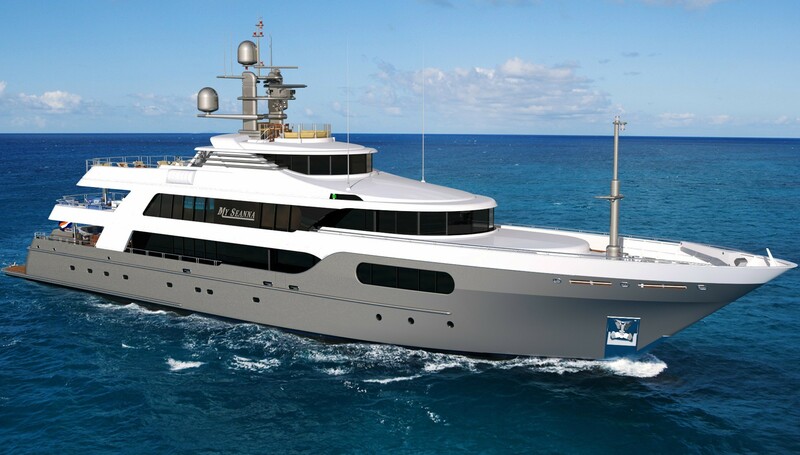 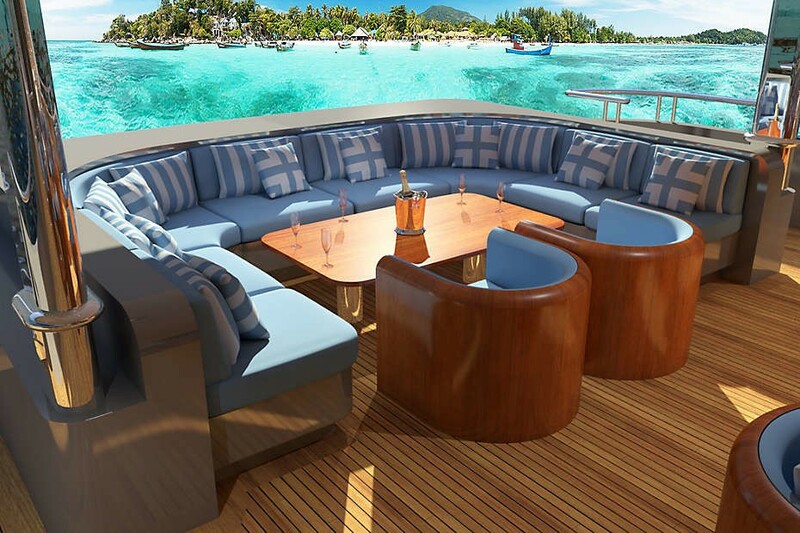 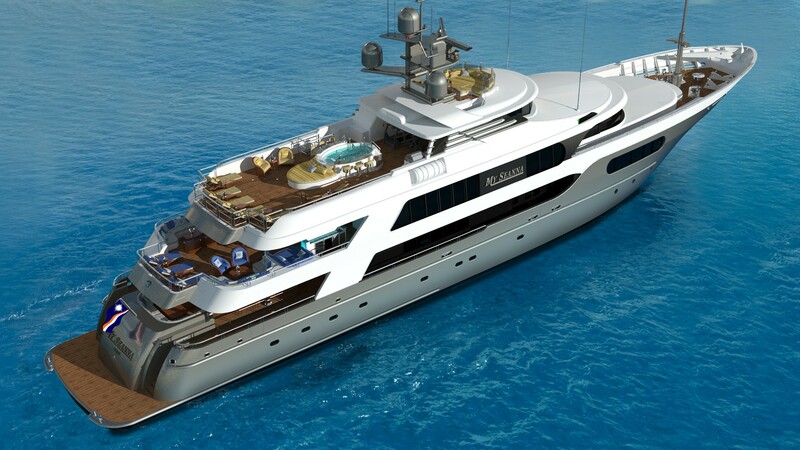 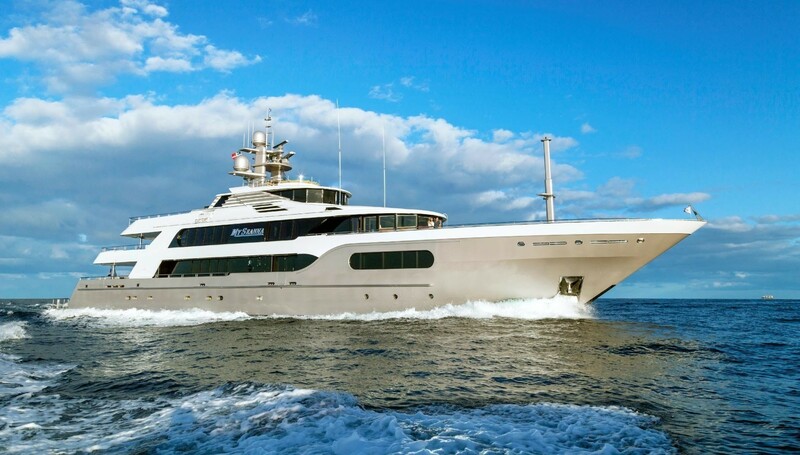 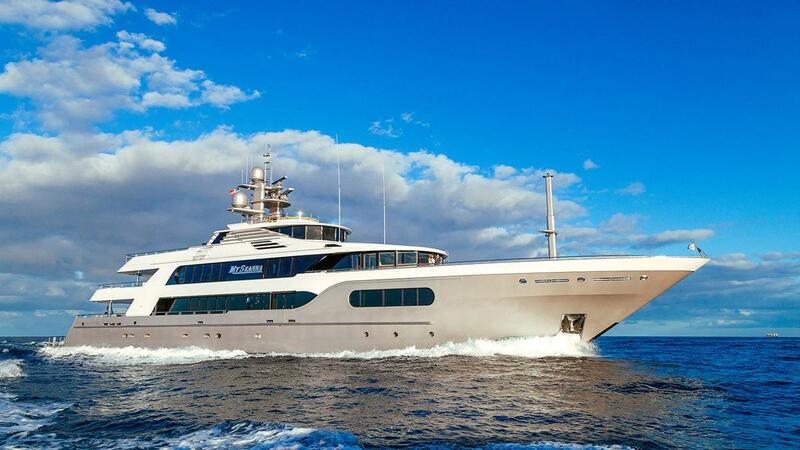 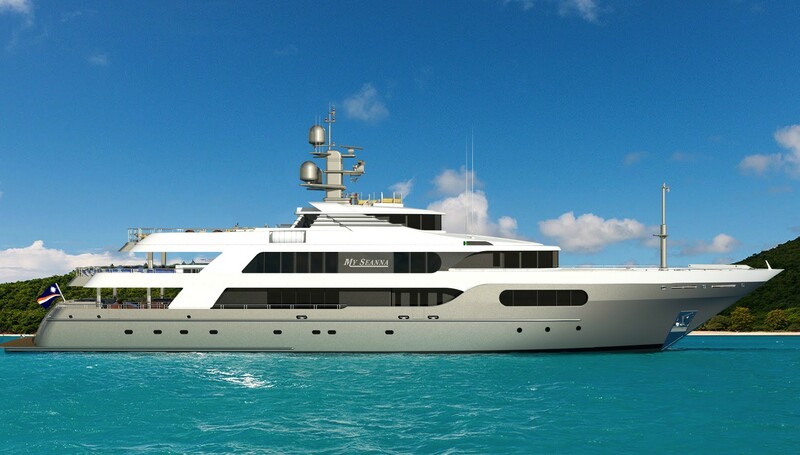 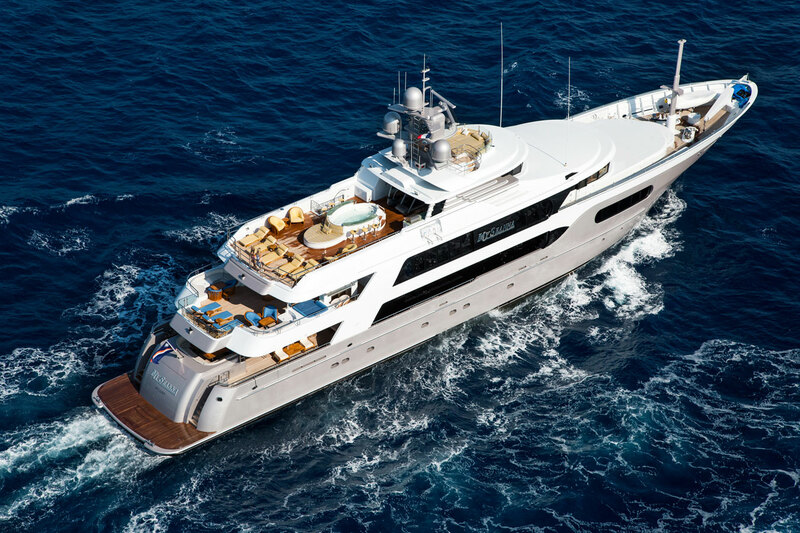 Superyacht MY SEANNA can accommodate 12 guests in 6 luxurious cabins. 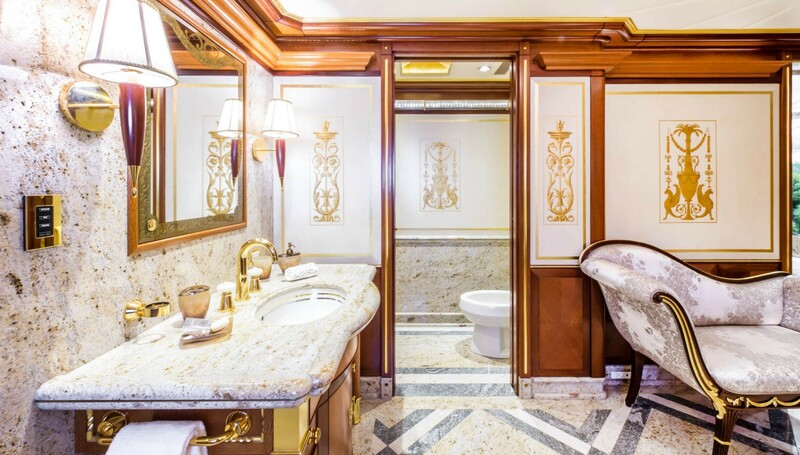 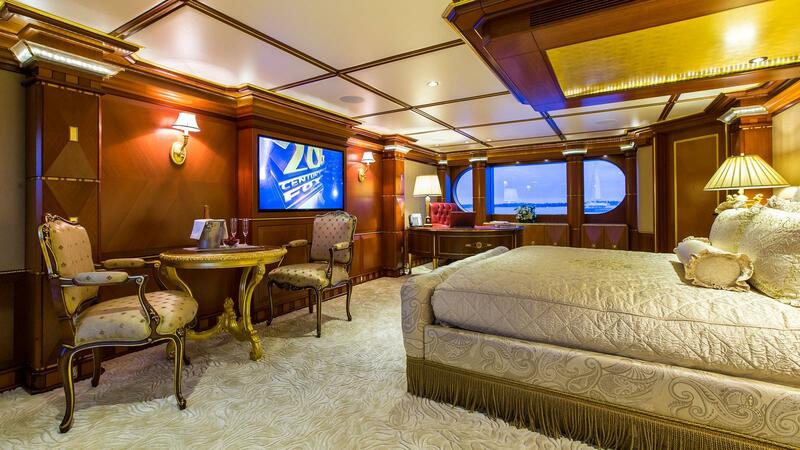 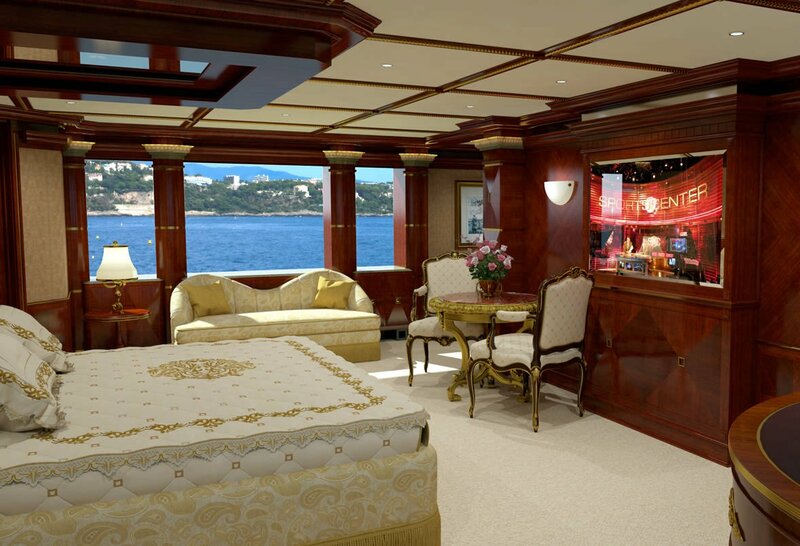 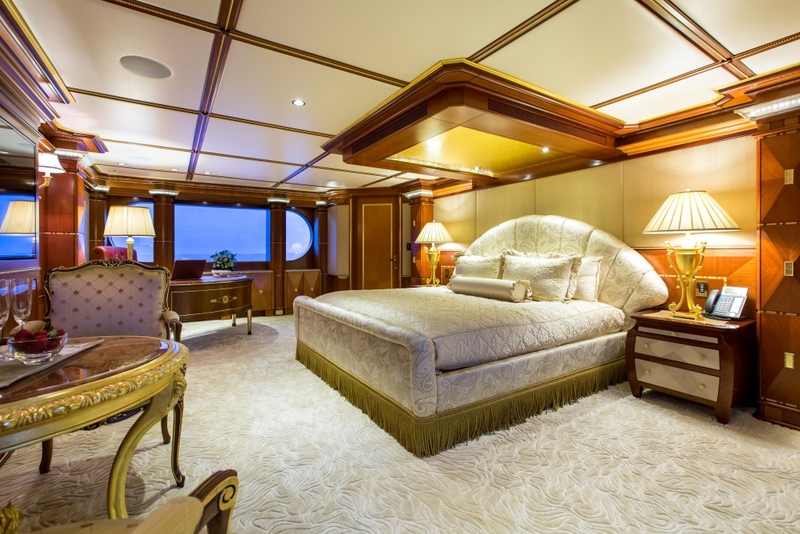 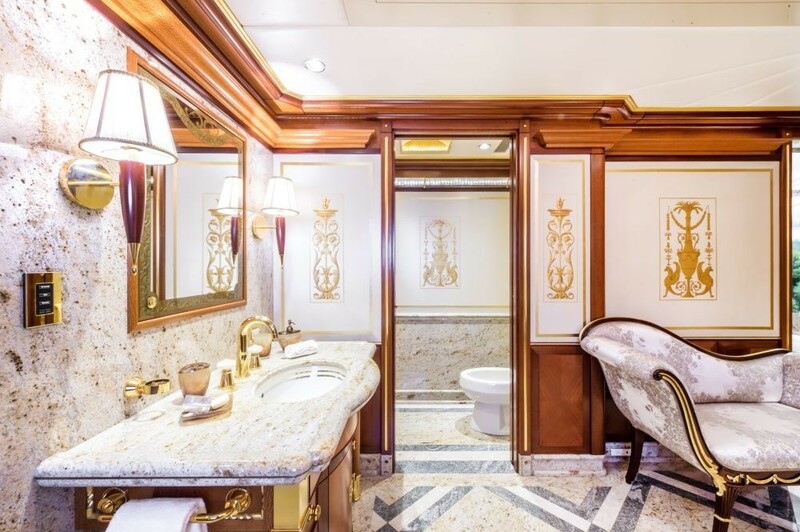 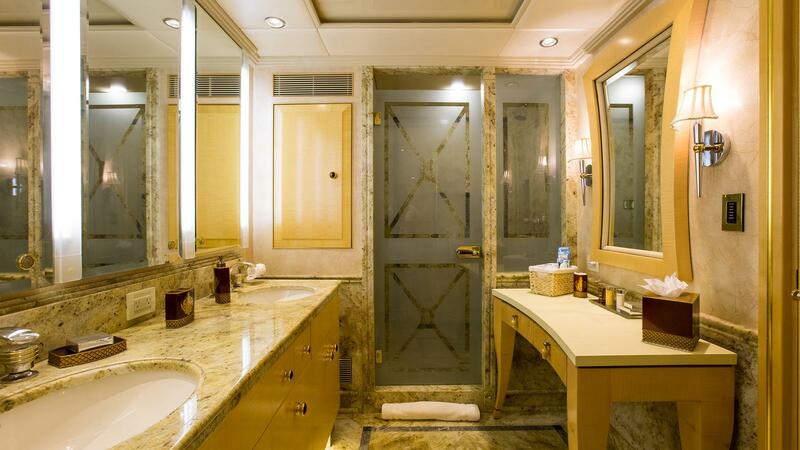 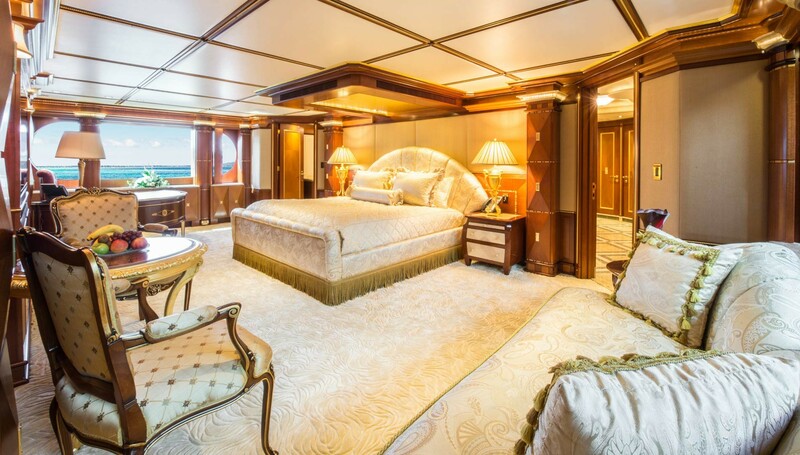 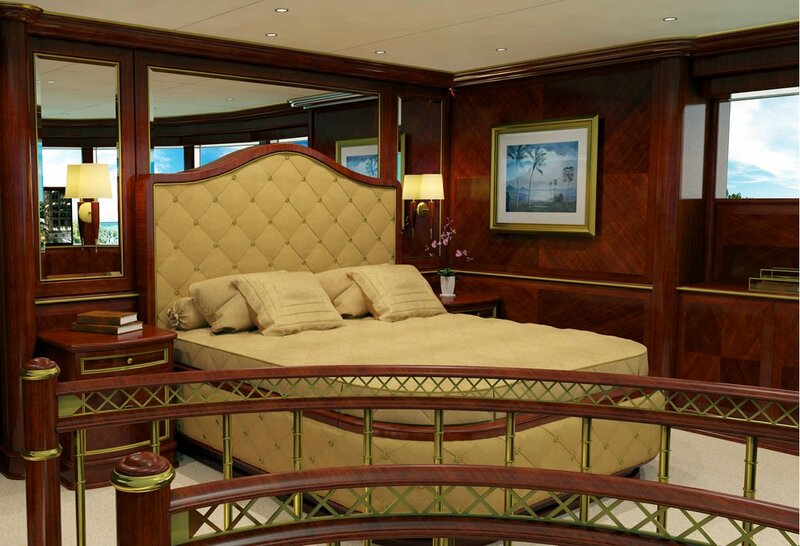 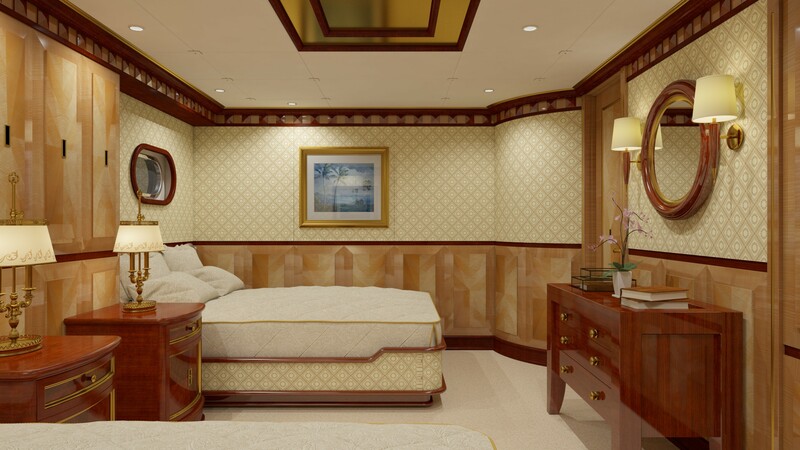 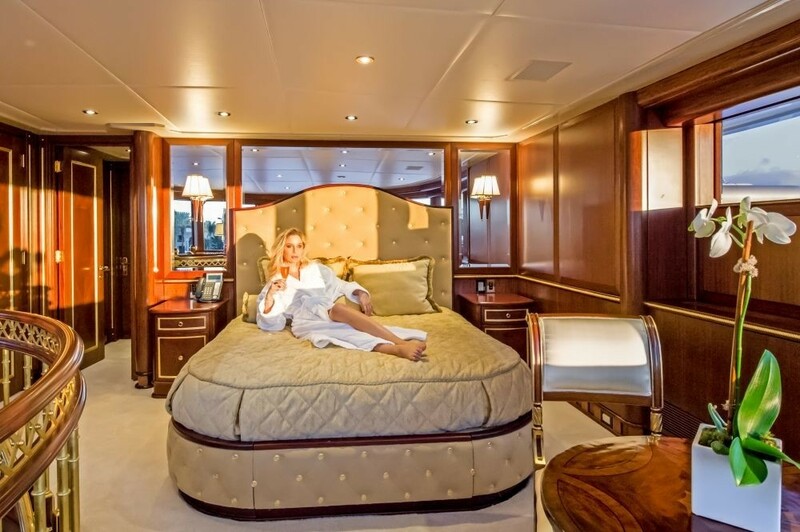 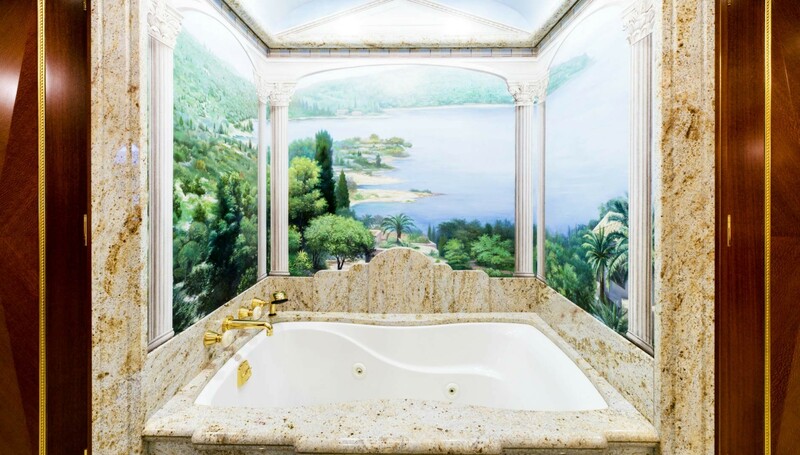 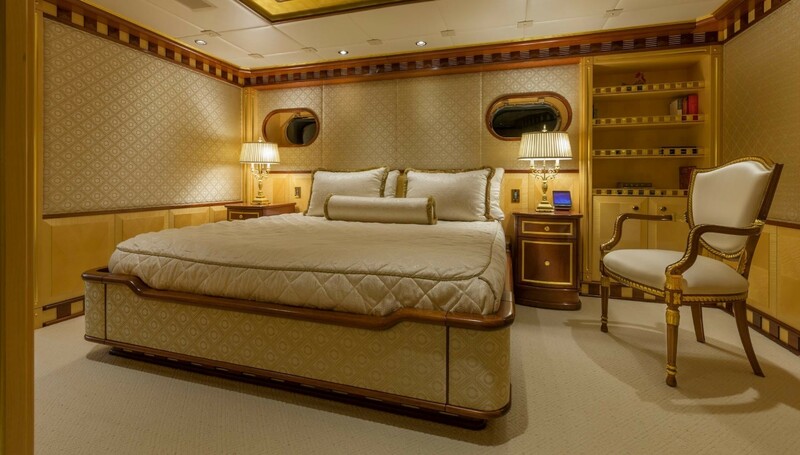 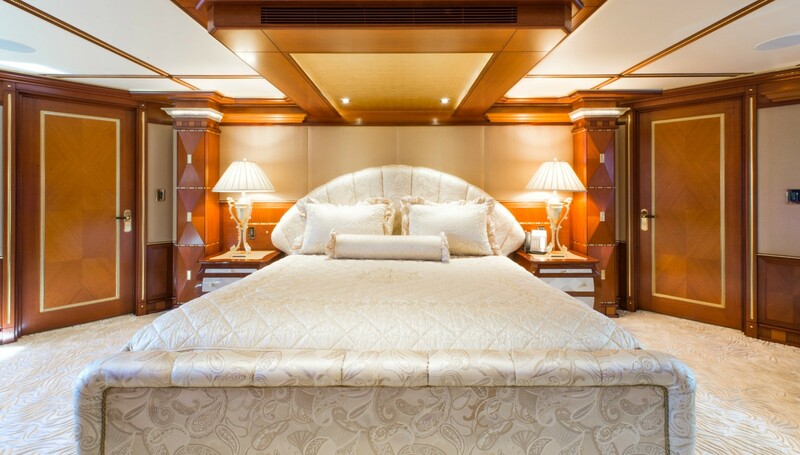 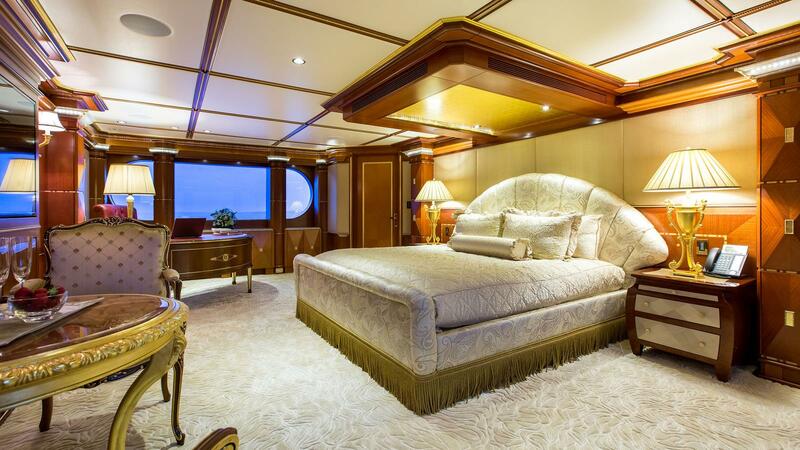 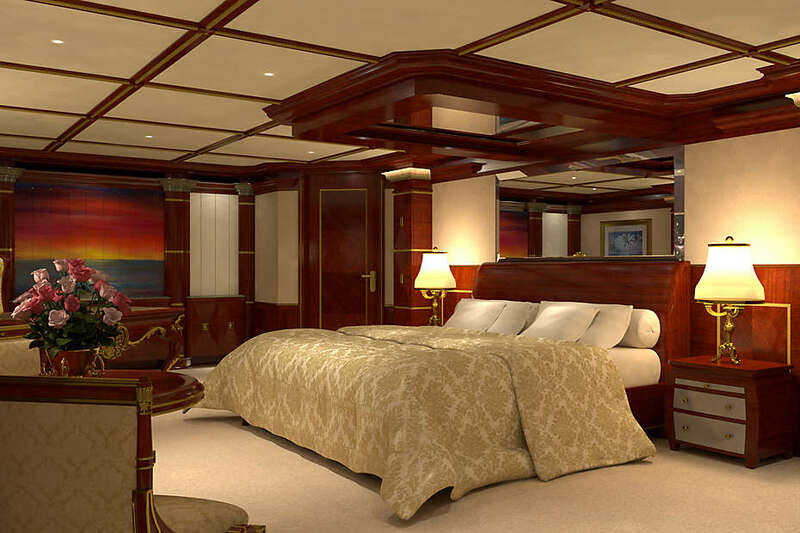 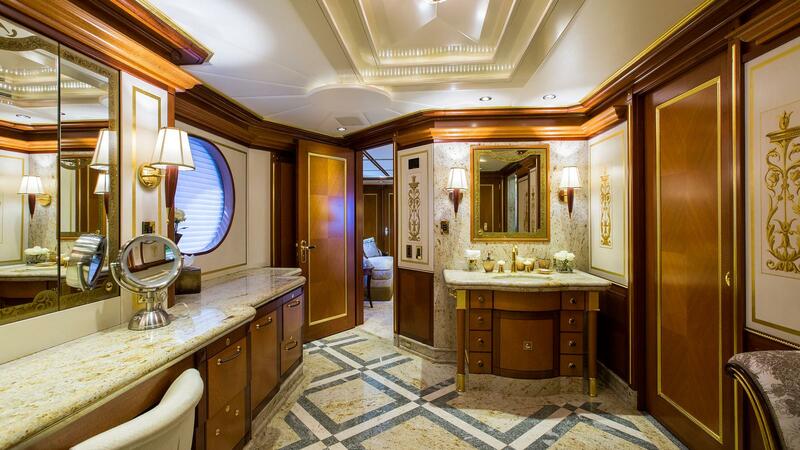 Her Master suite which is located on the Main Deck forward is full width of the beam and has a King sized bed. 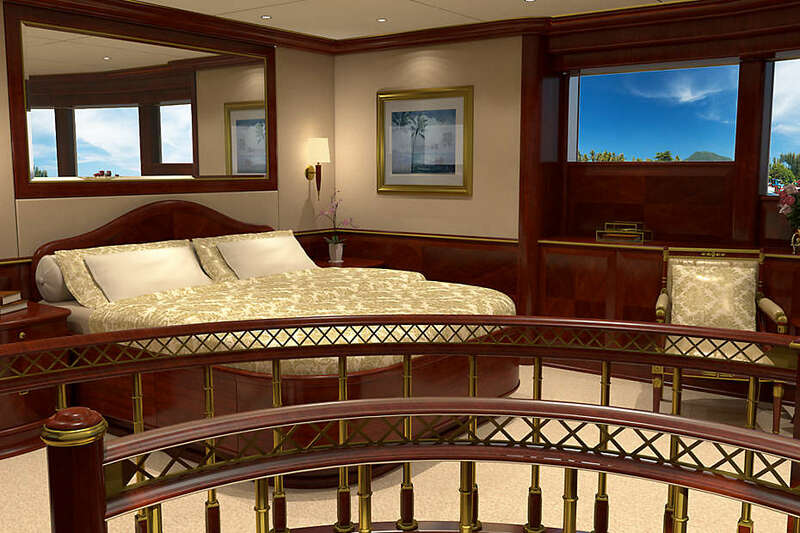 This luxurious cabin has a seating area and desk and a 32" flat screen TV with surround sound. 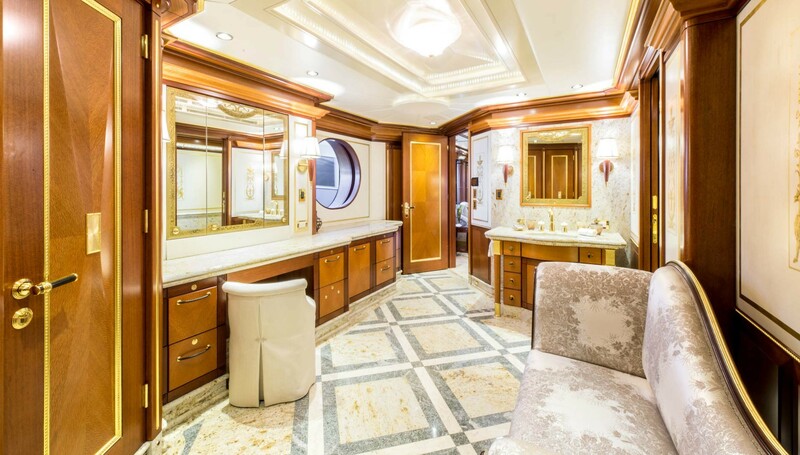 The suite boasts a semi circle His and Hers ensuite with separate wash closets and bidets linked by a Spa Pool tub and large shower stall. 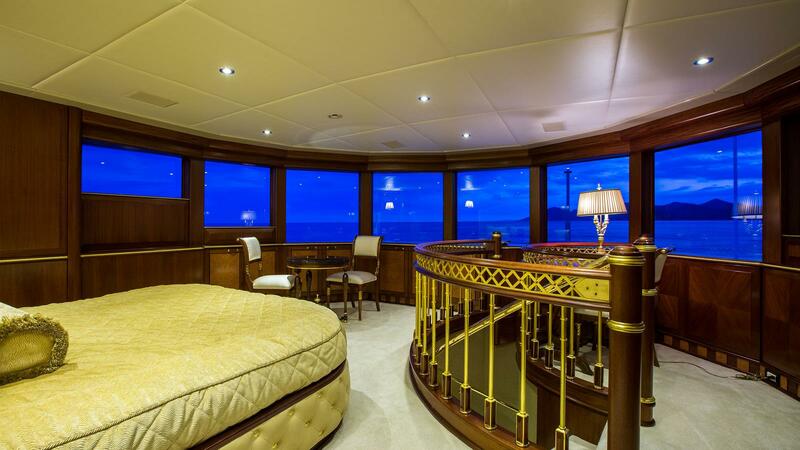 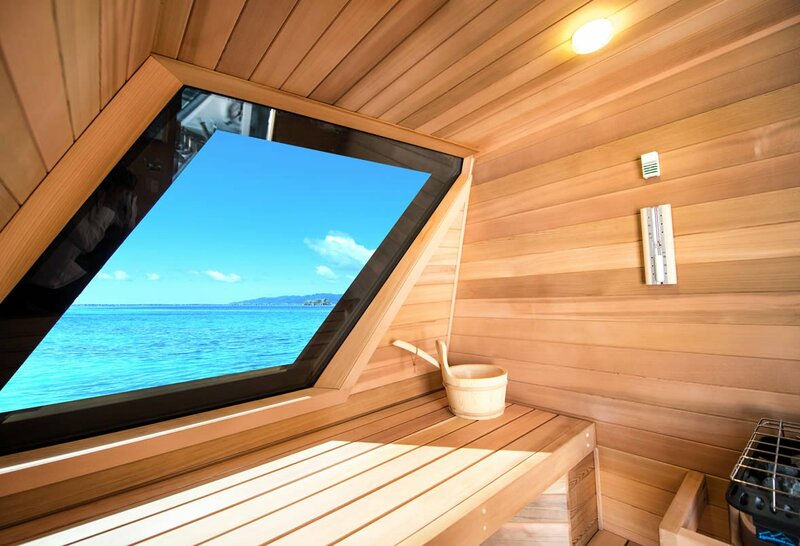 There is a VIP Cabin on the Bridge deck offering 360 degrees views. 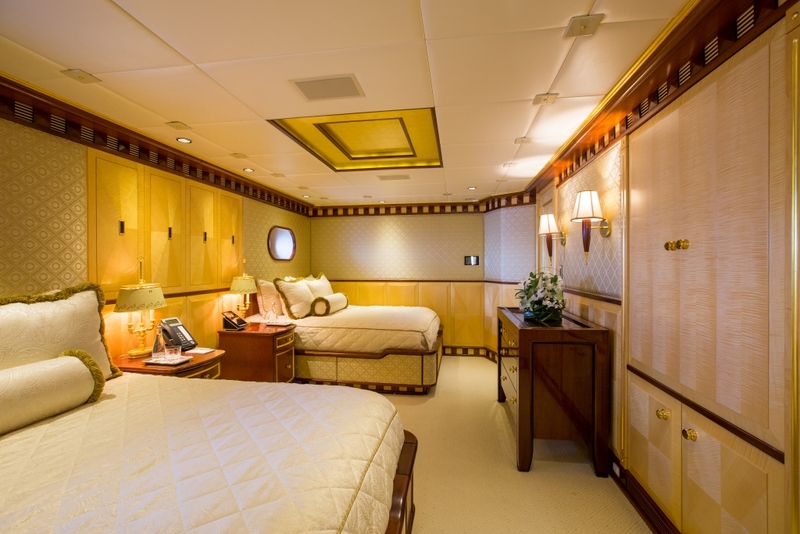 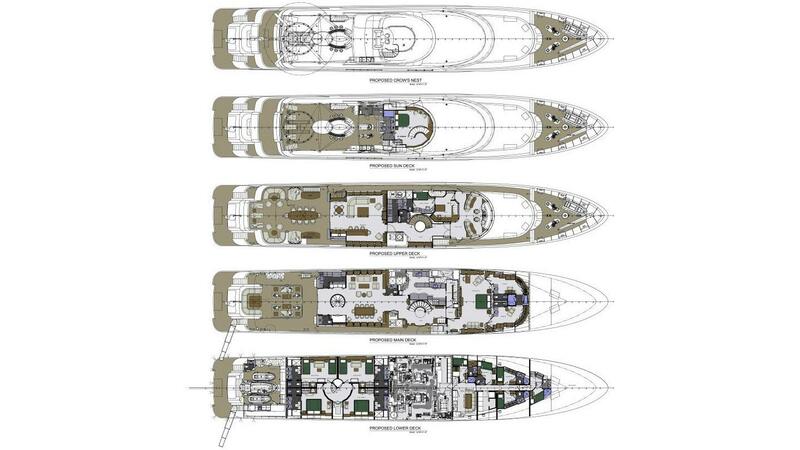 Below decks there are 2 VIP's cabins with king bed and ensuite and 2 large Twin cabins with seating area. 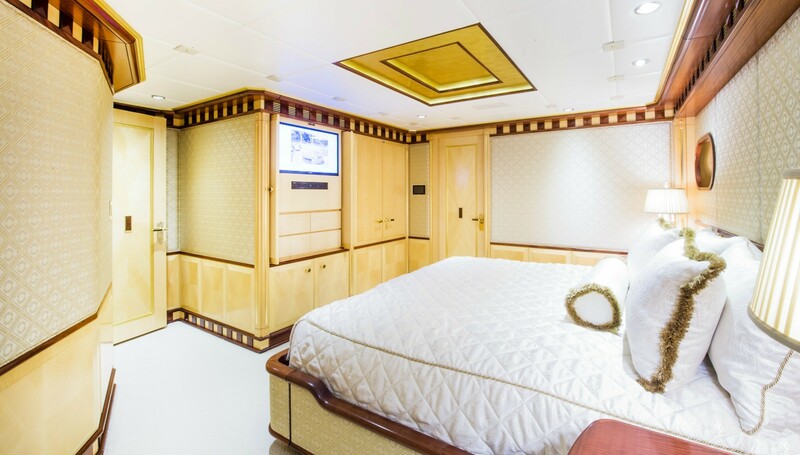 Each Cabin has an ensuite, SAT TV and iPod Stations linked to a surround sound system. 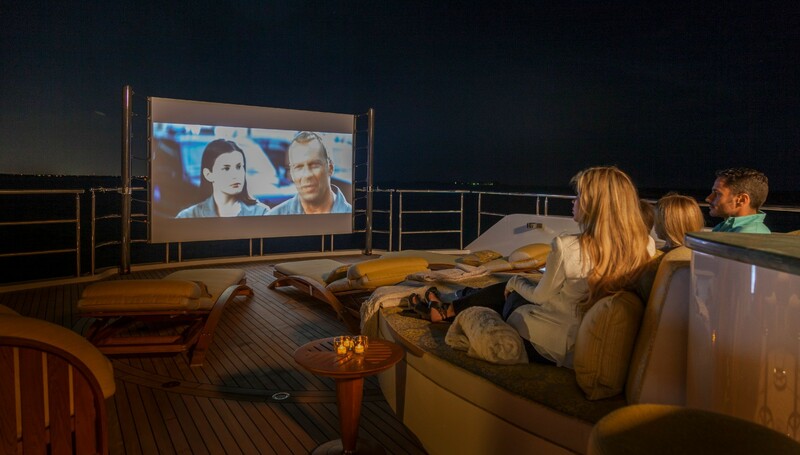 Movies and music on demand. 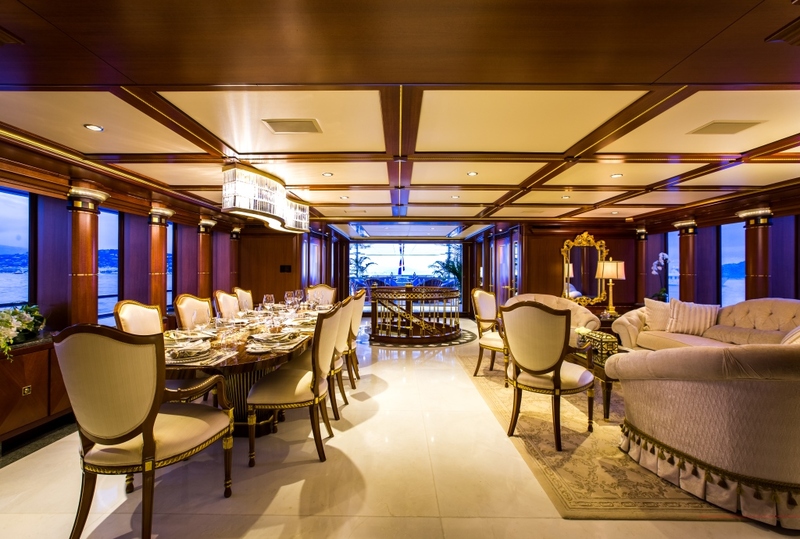 Creston control and remote systems including Creston Concierge- guests can order off a special menu direct from their cabin 24/7. 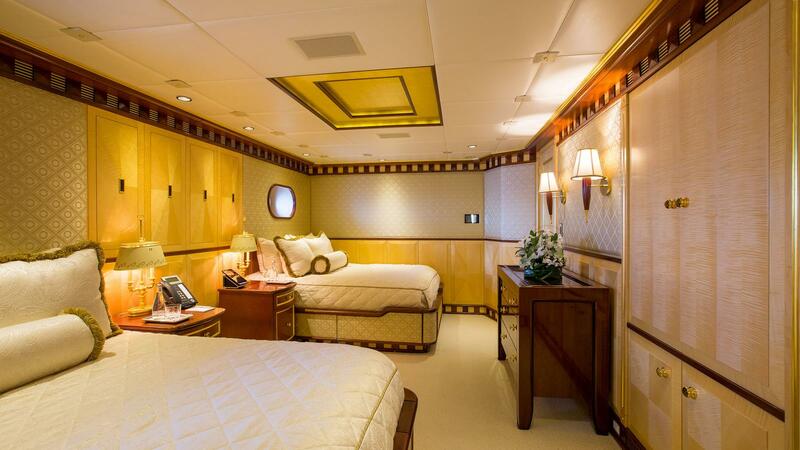 All staterooms have mini fridges.